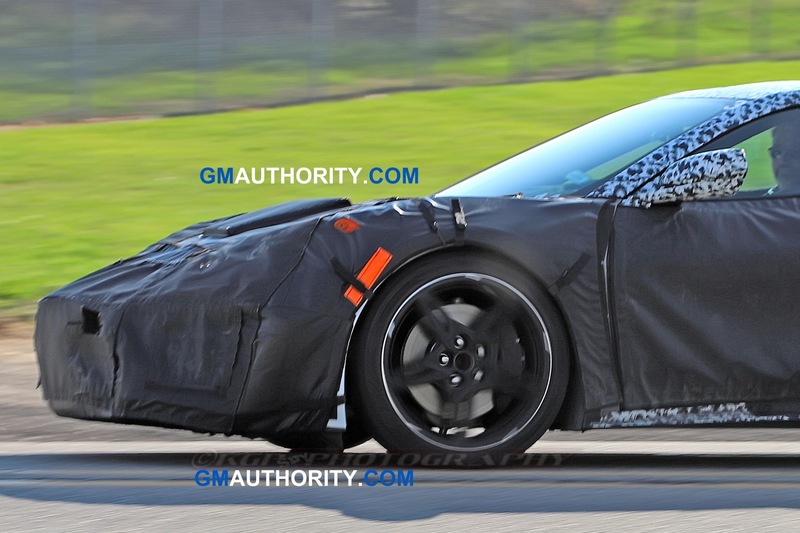 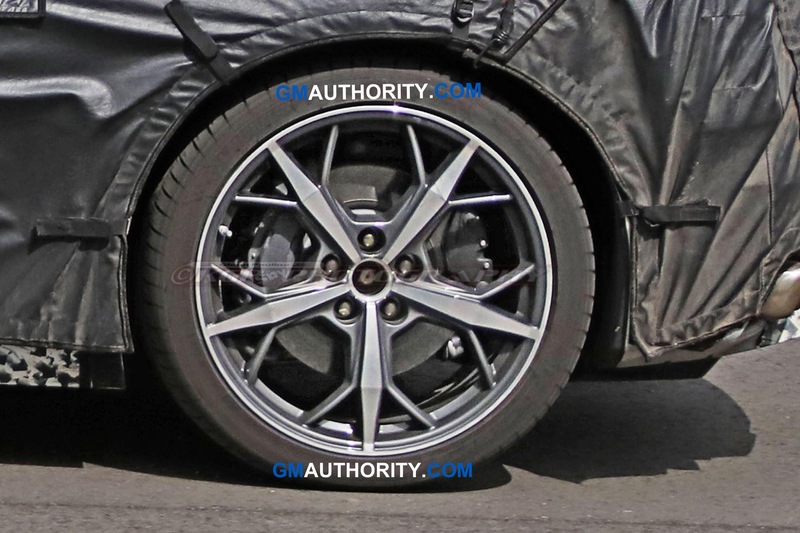 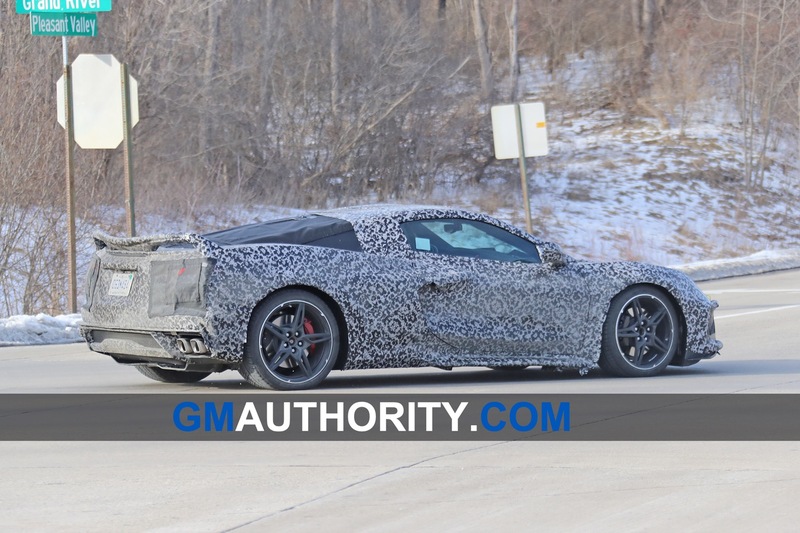 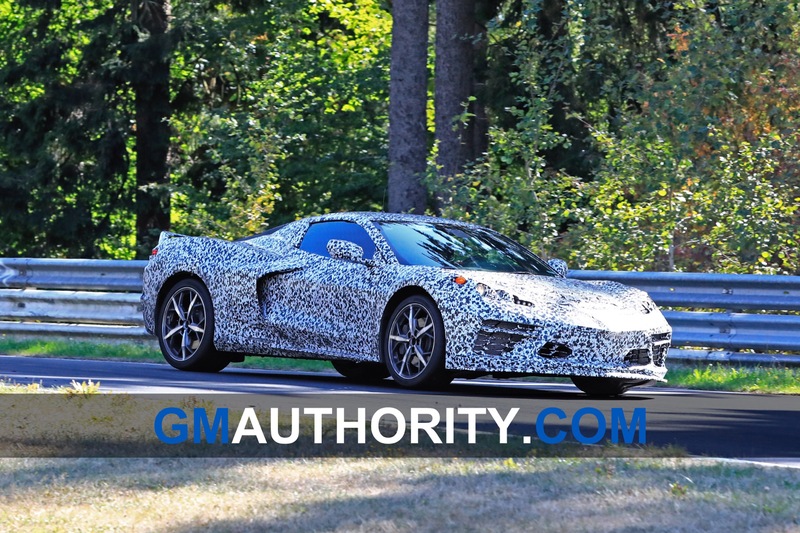 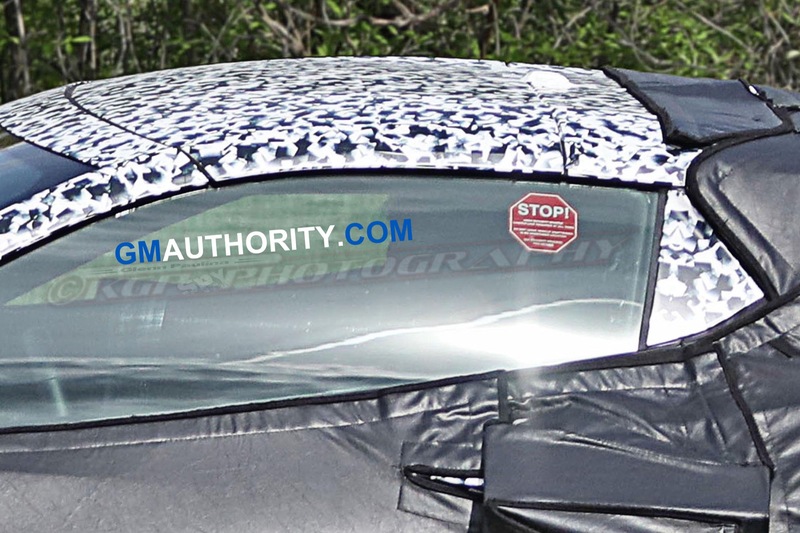 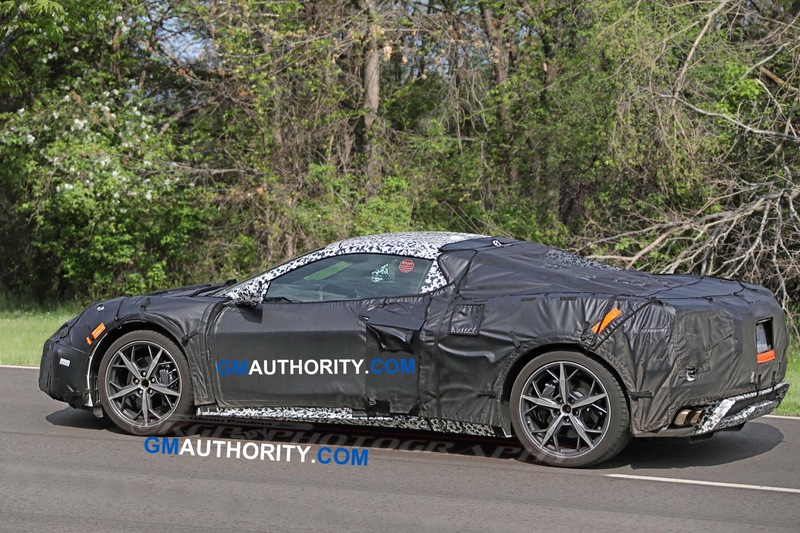 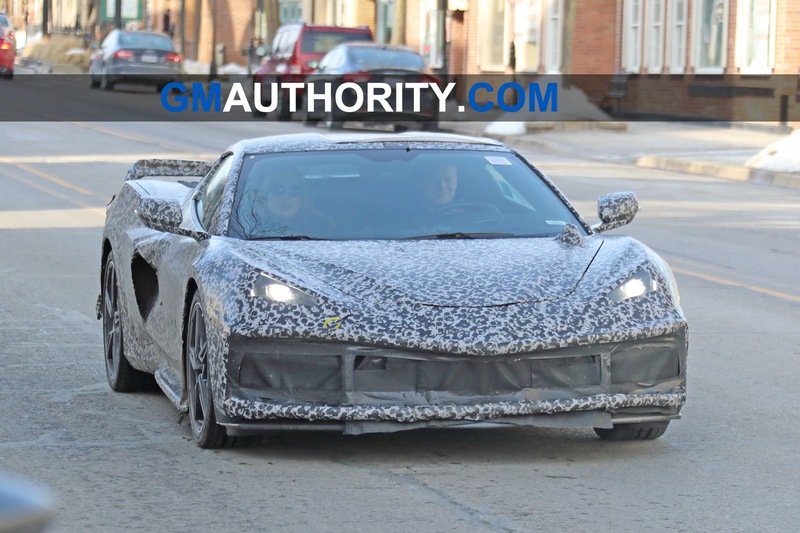 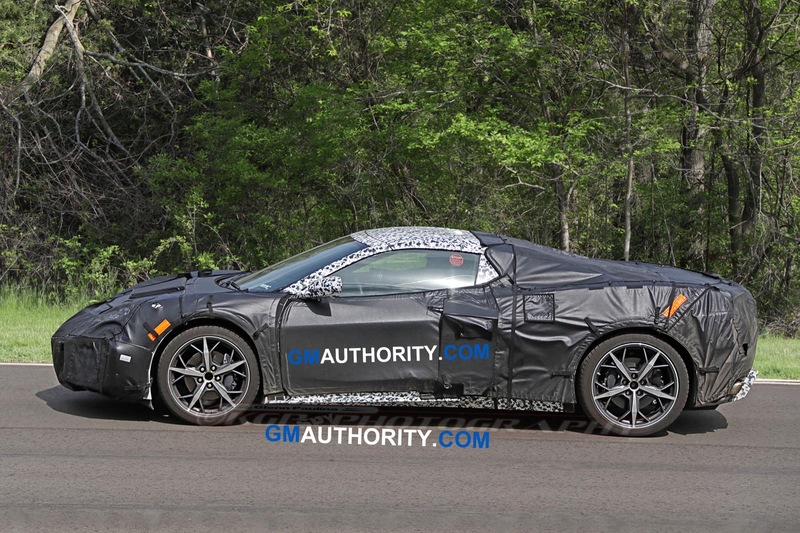 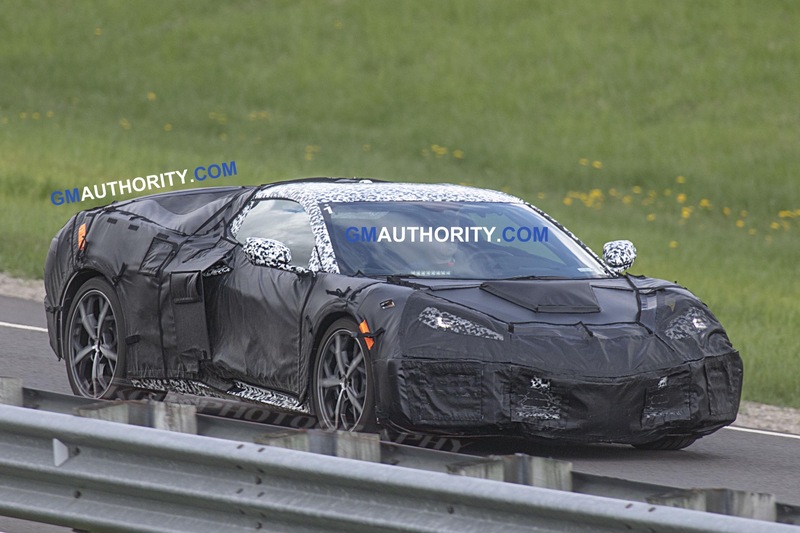 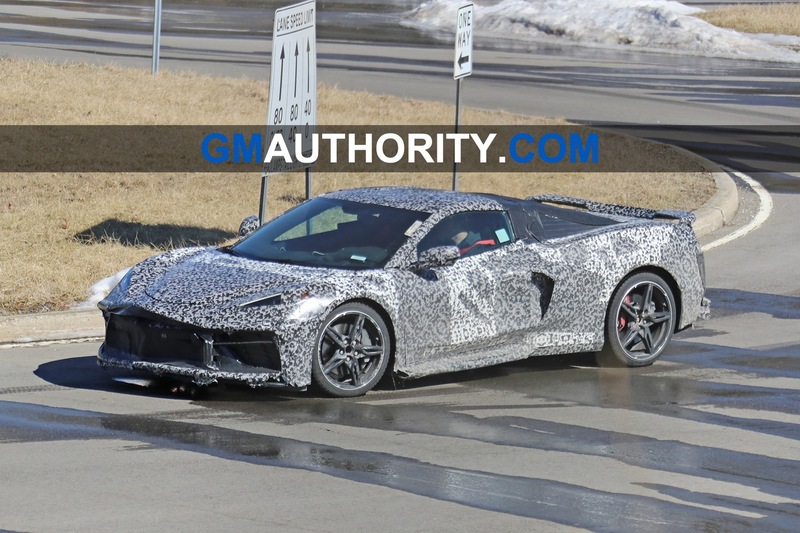 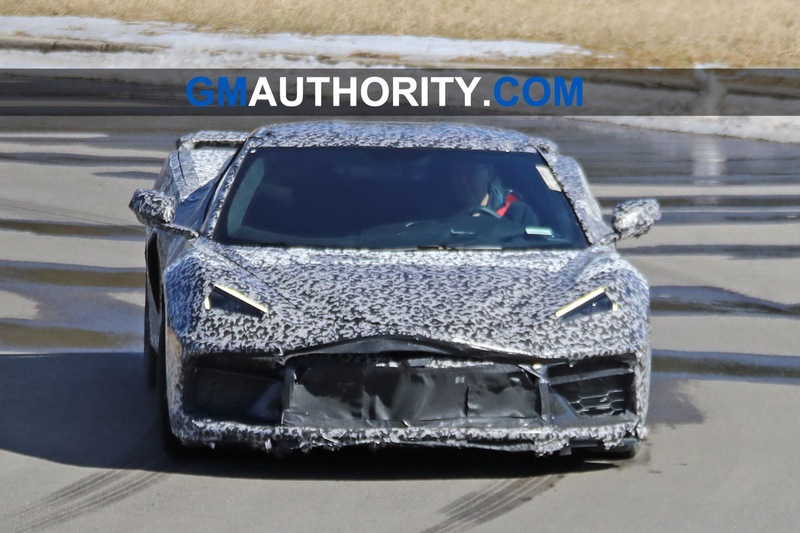 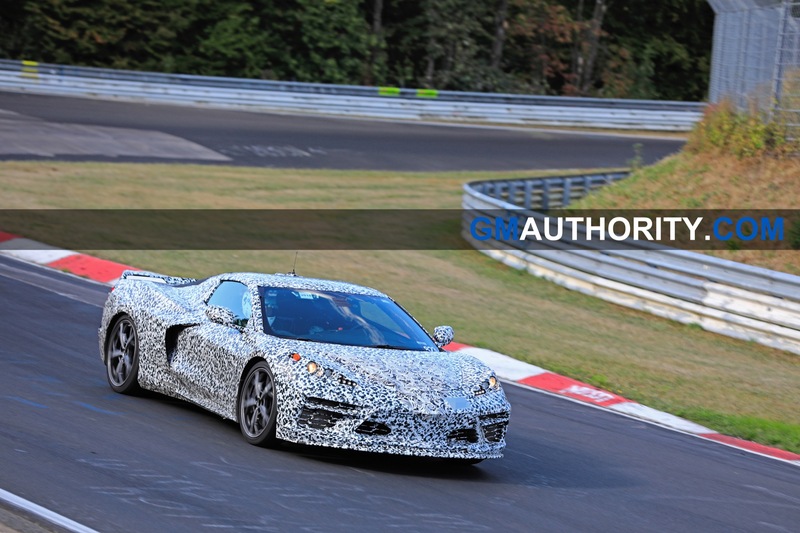 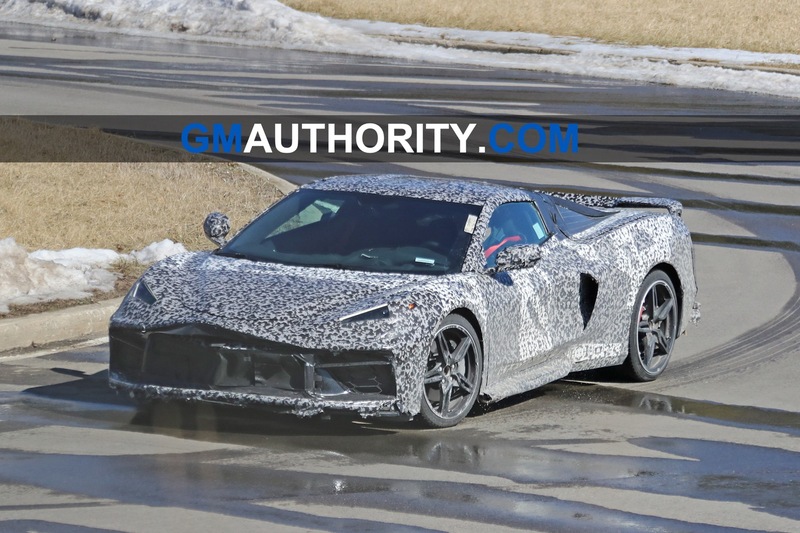 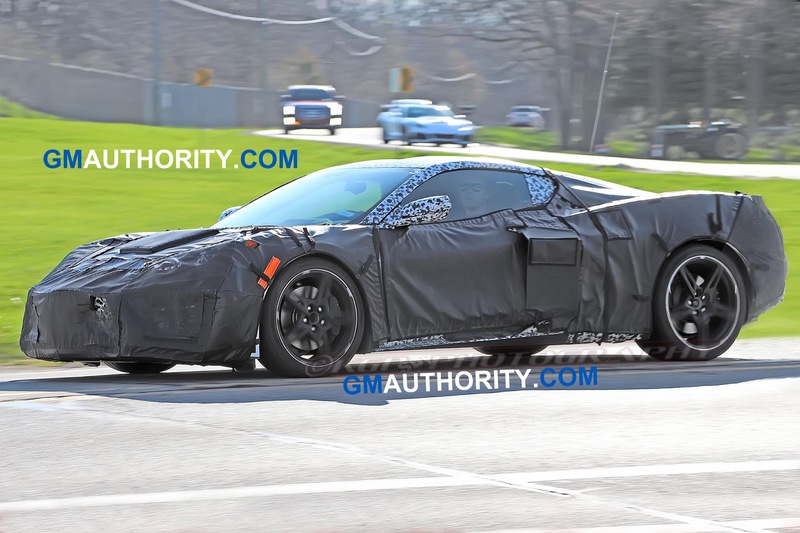 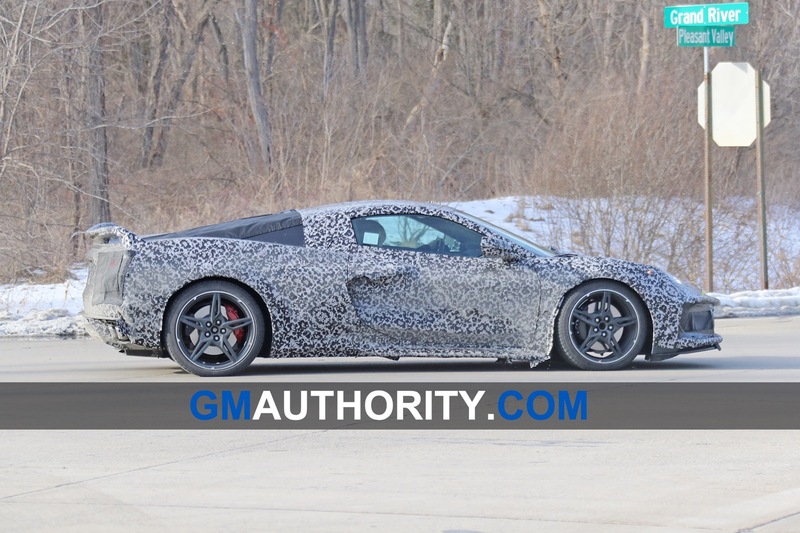 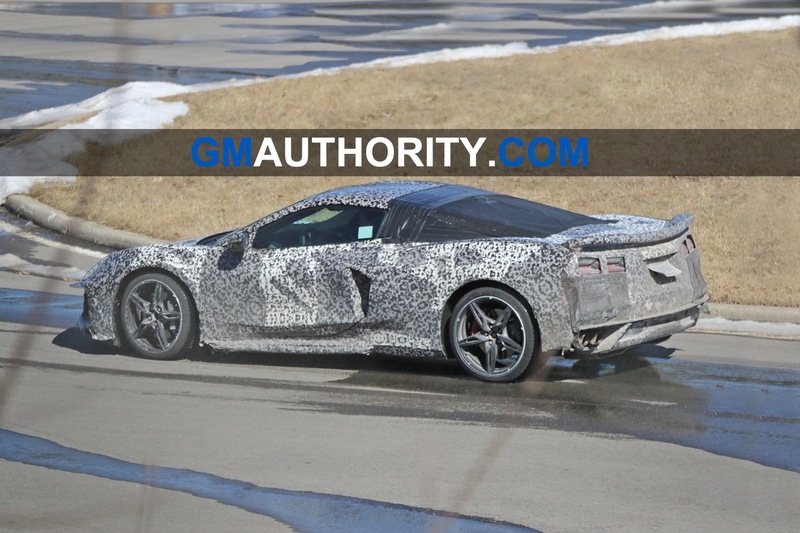 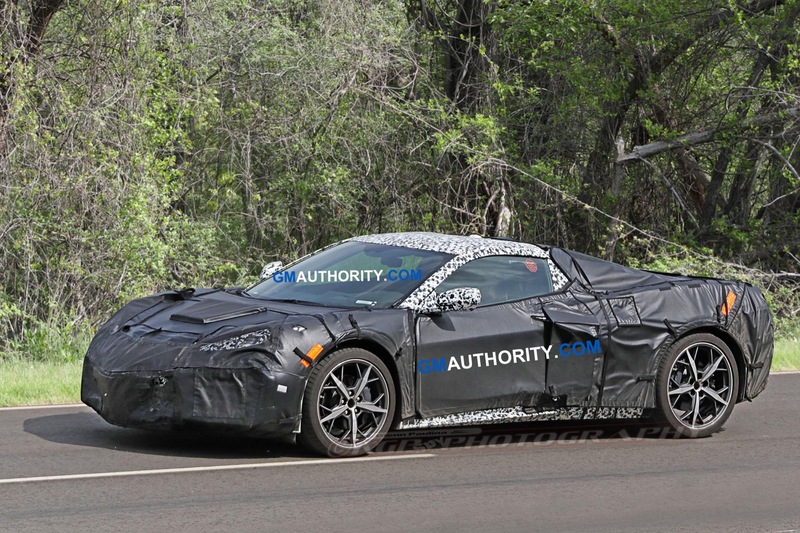 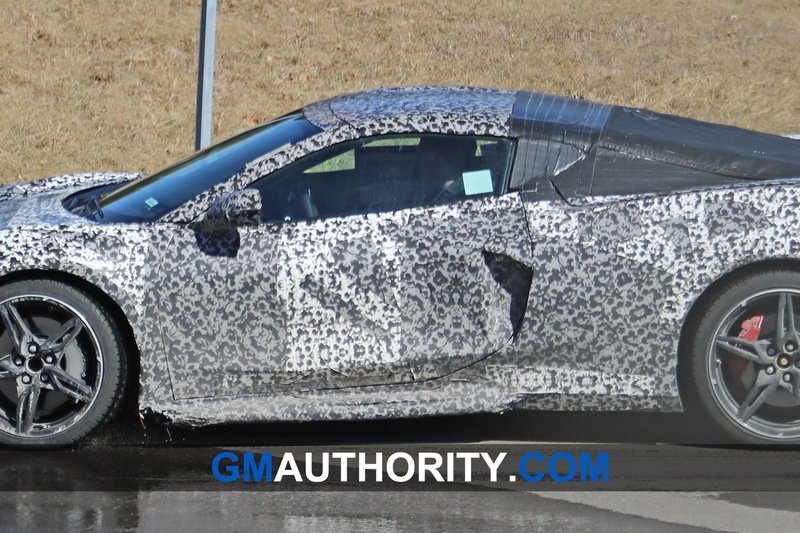 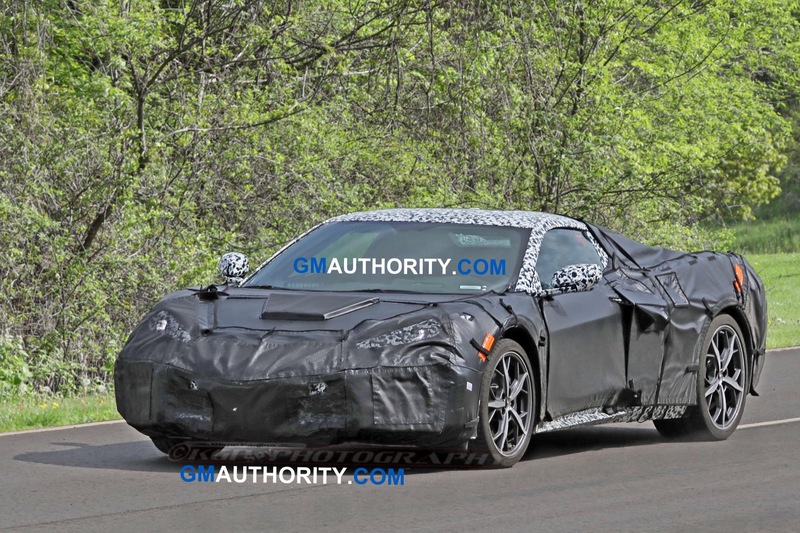 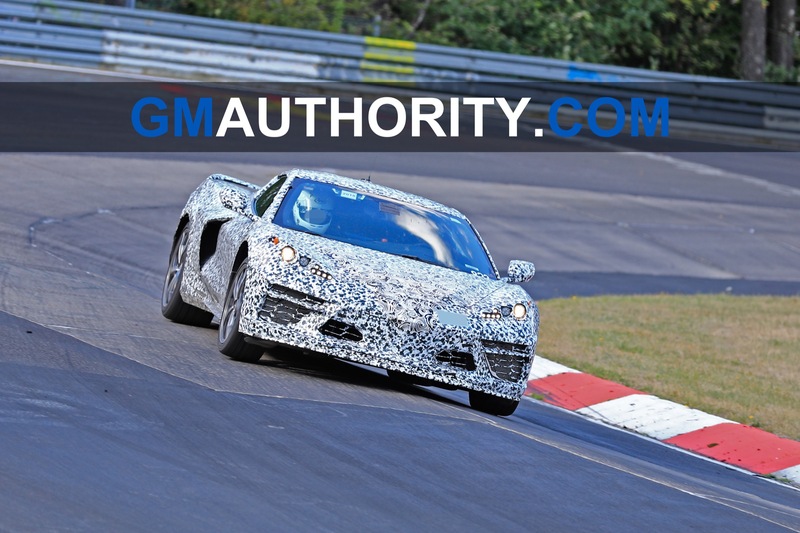 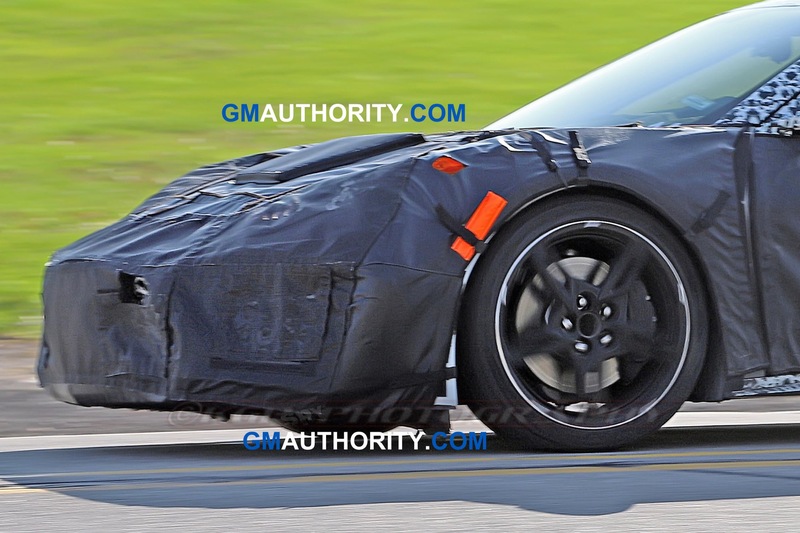 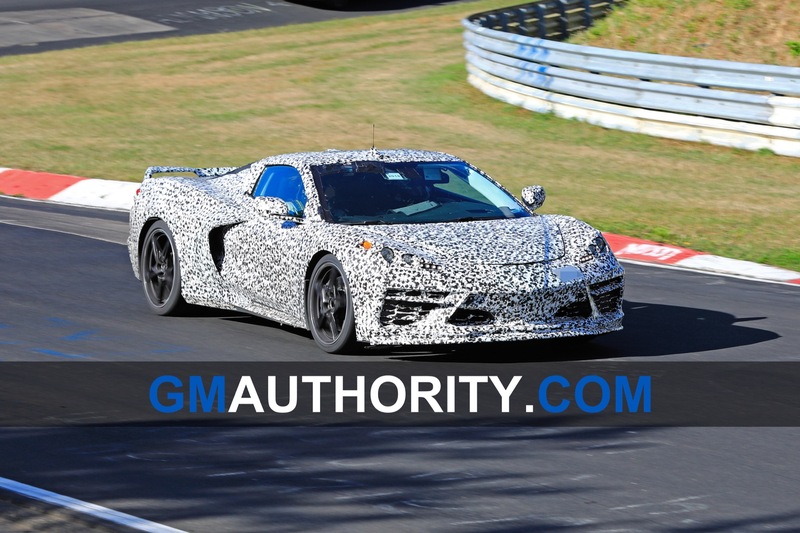 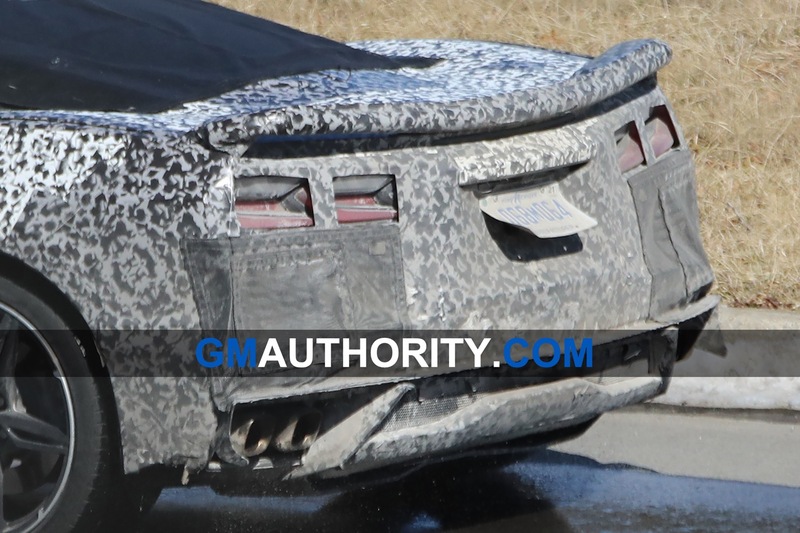 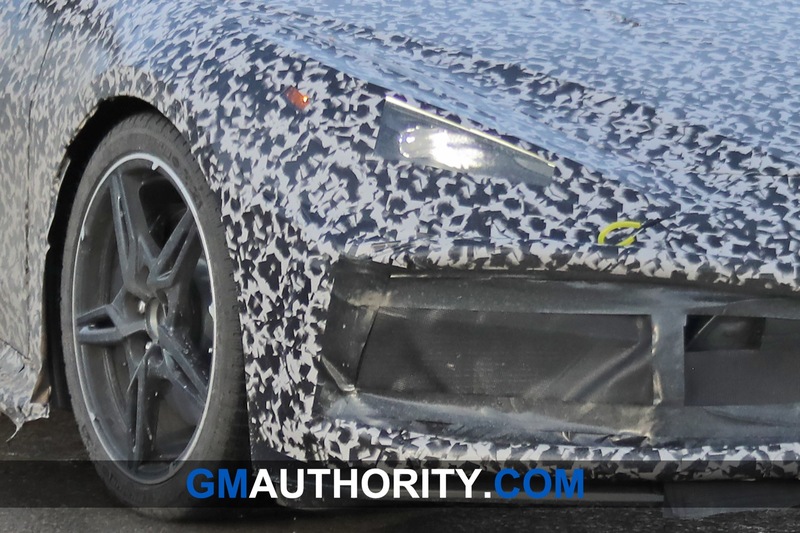 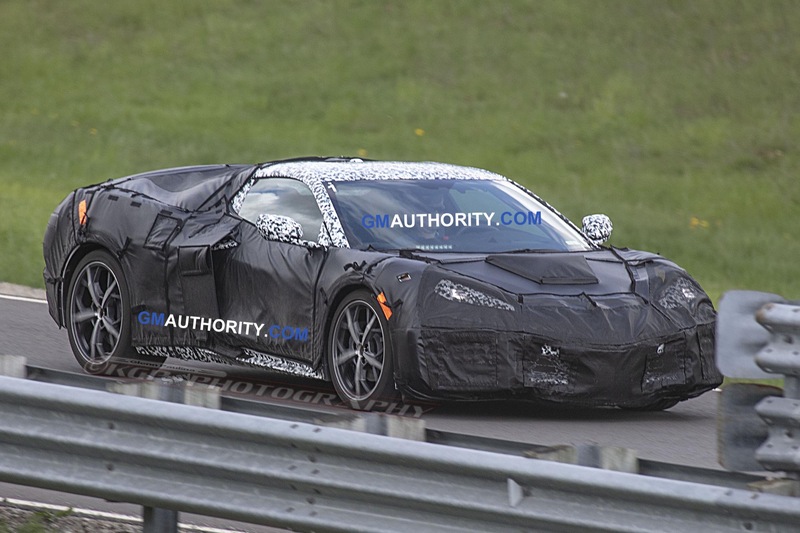 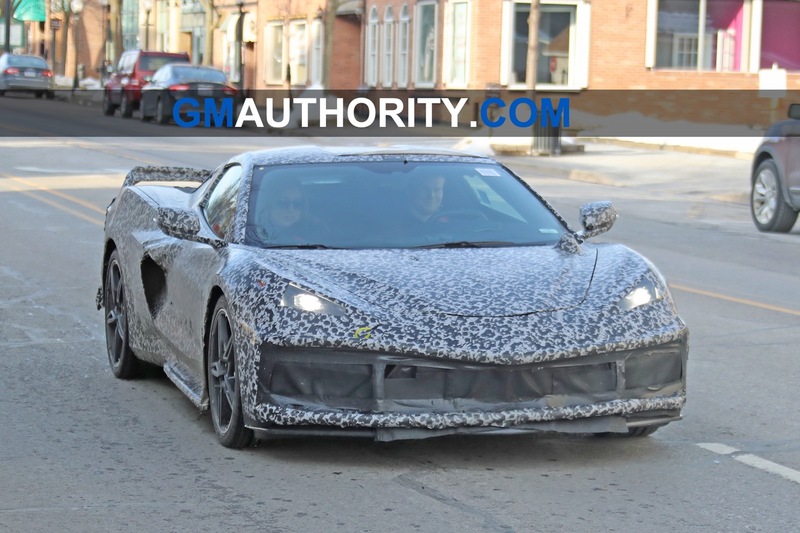 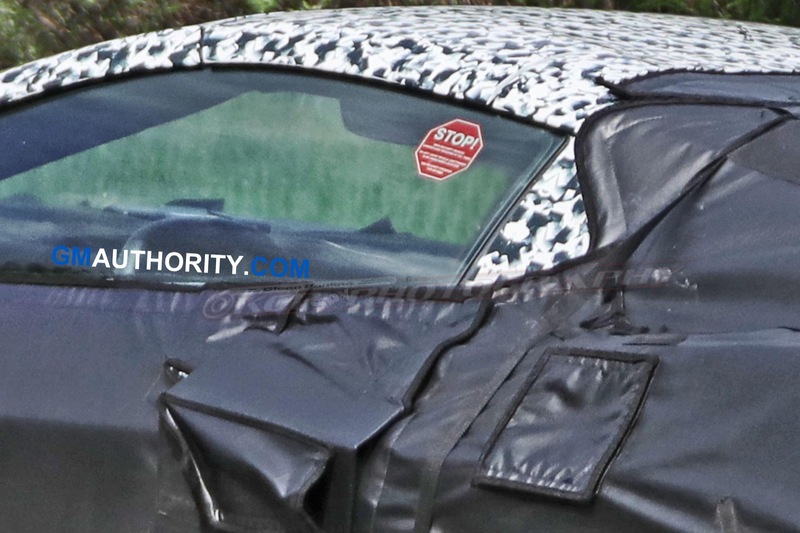 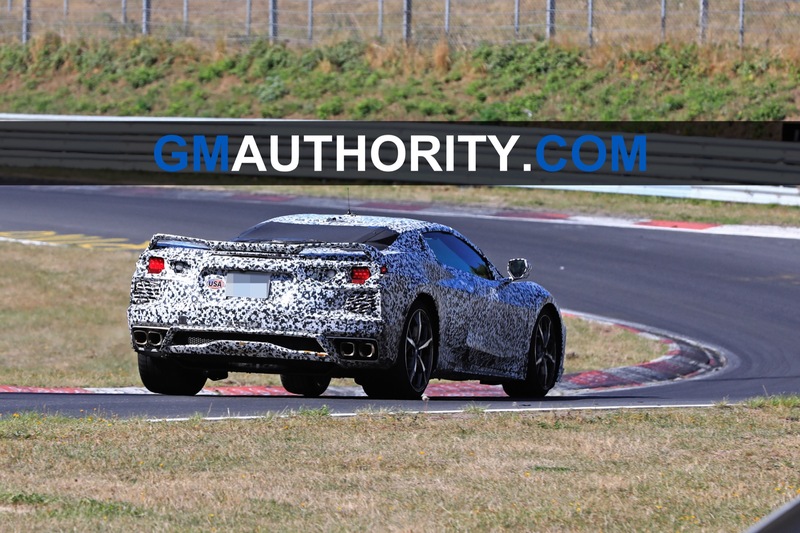 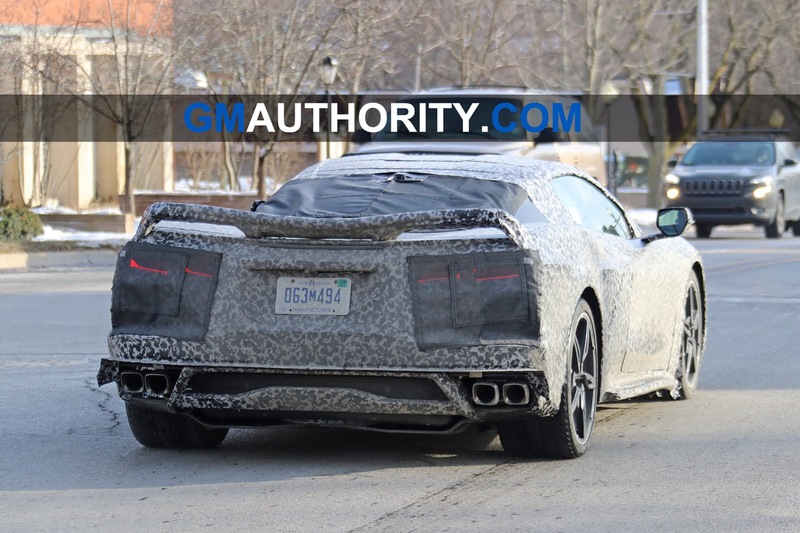 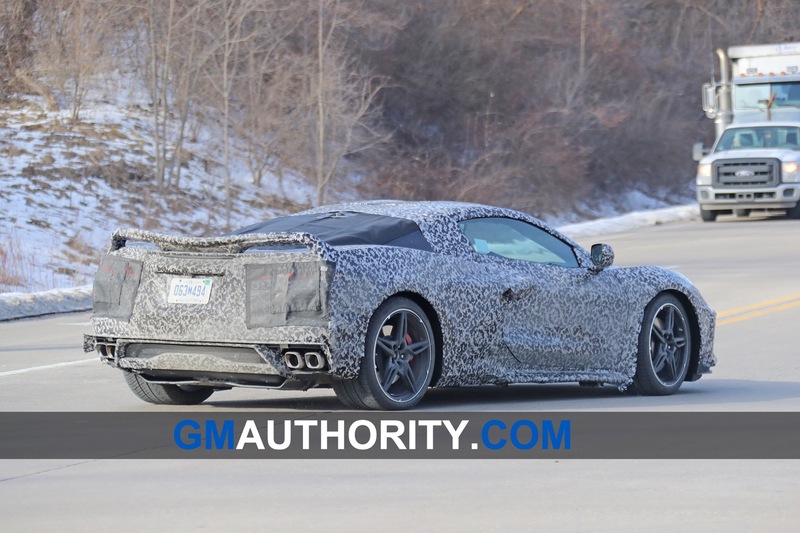 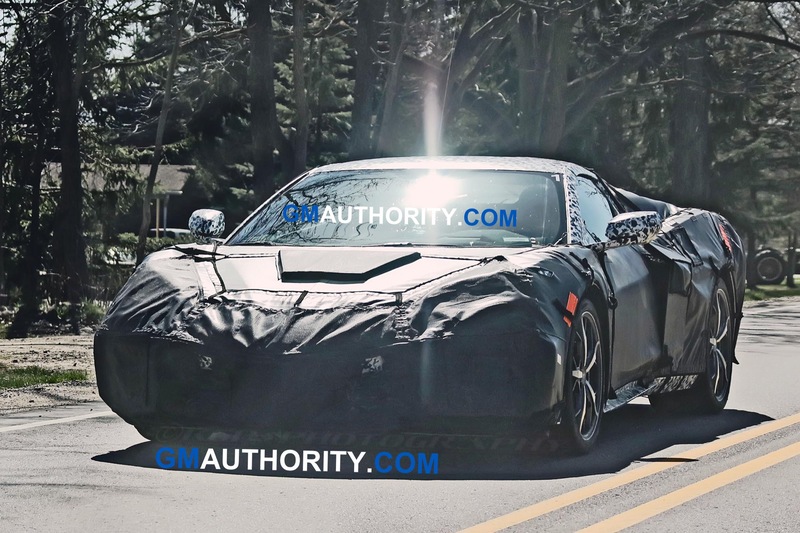 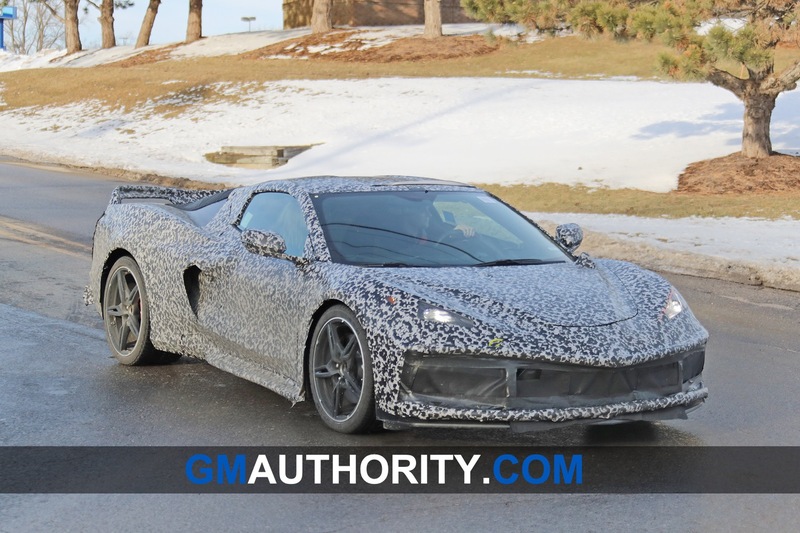 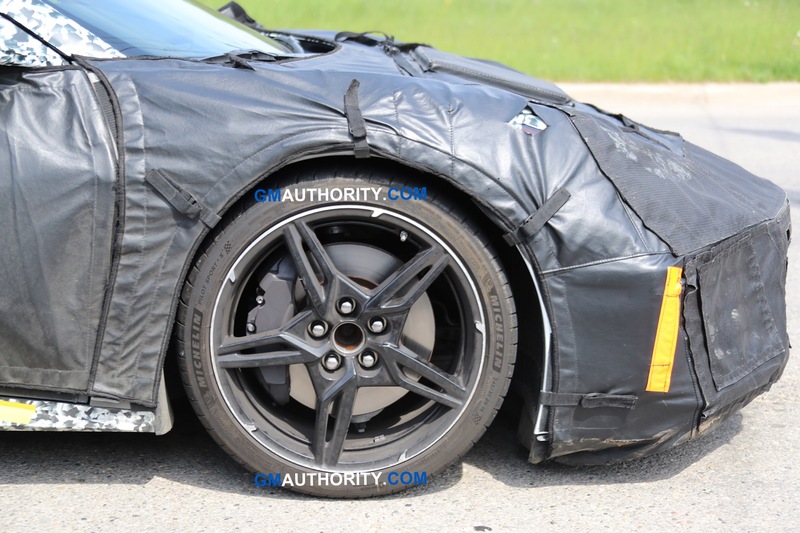 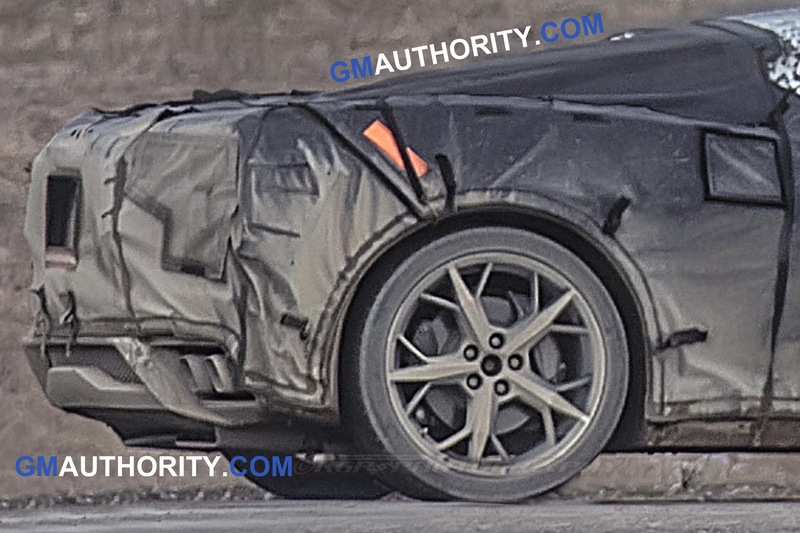 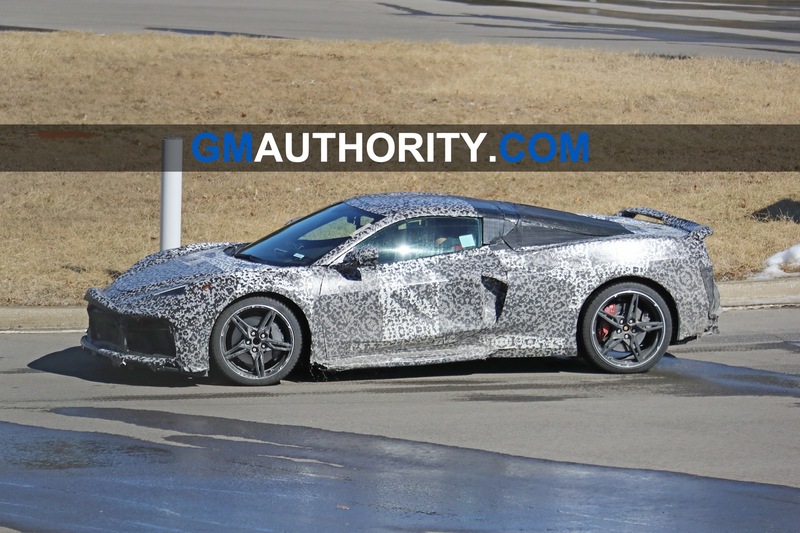 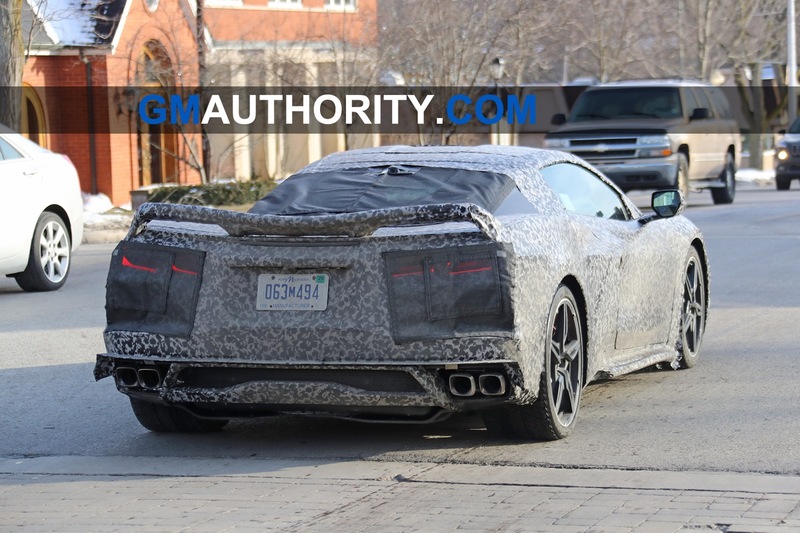 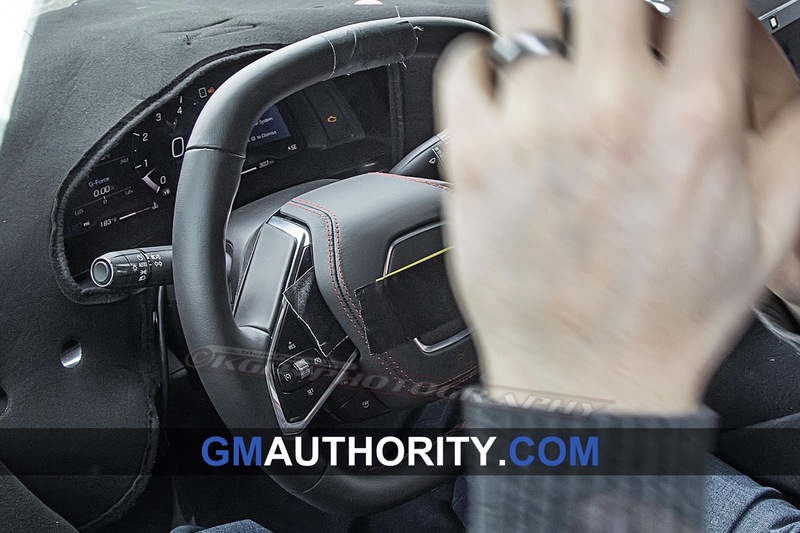 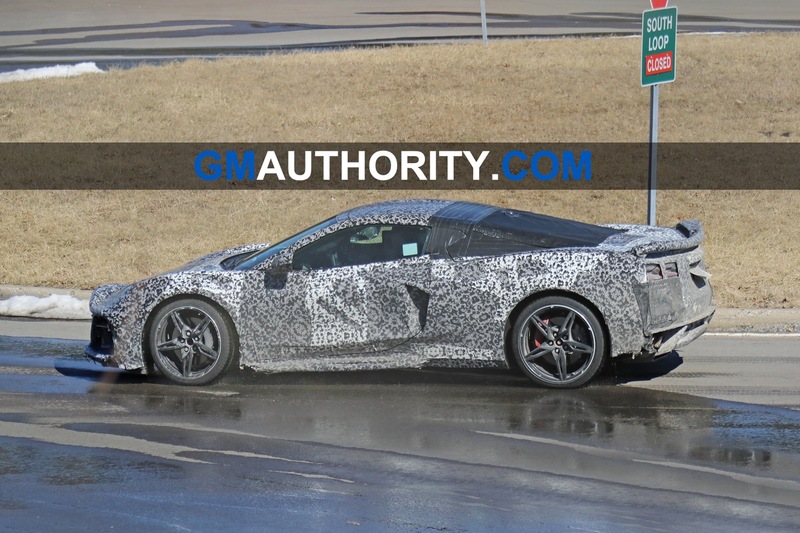 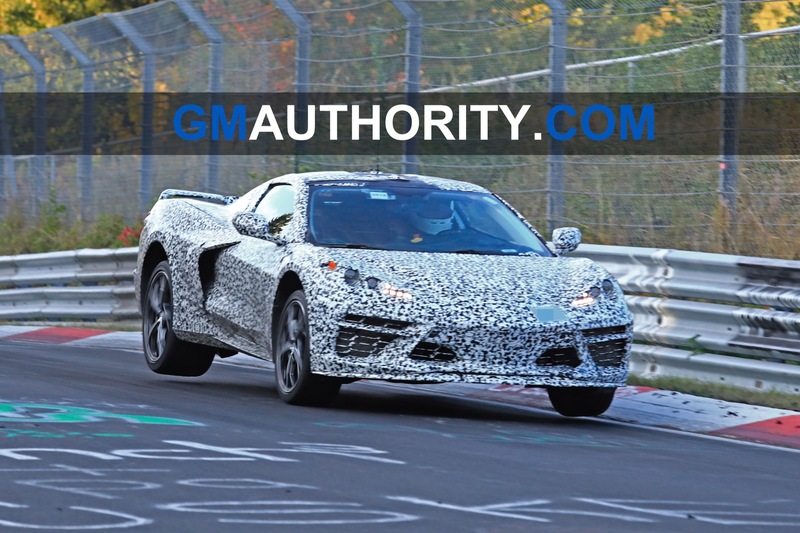 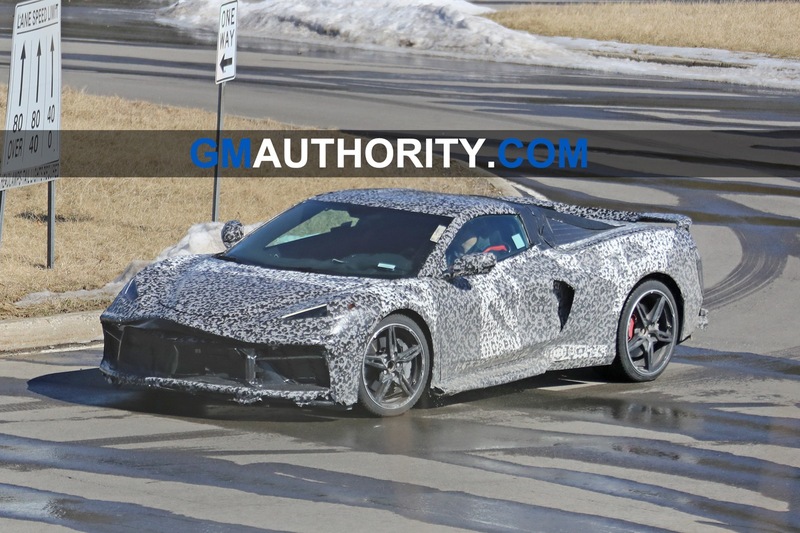 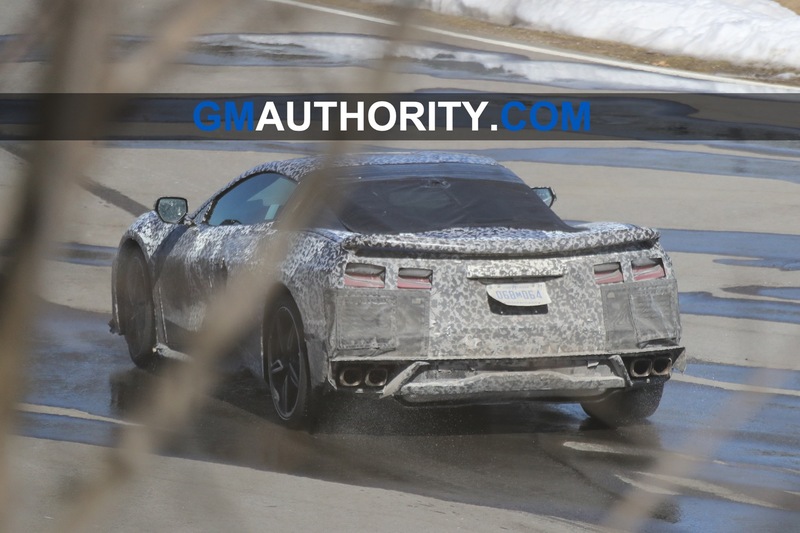 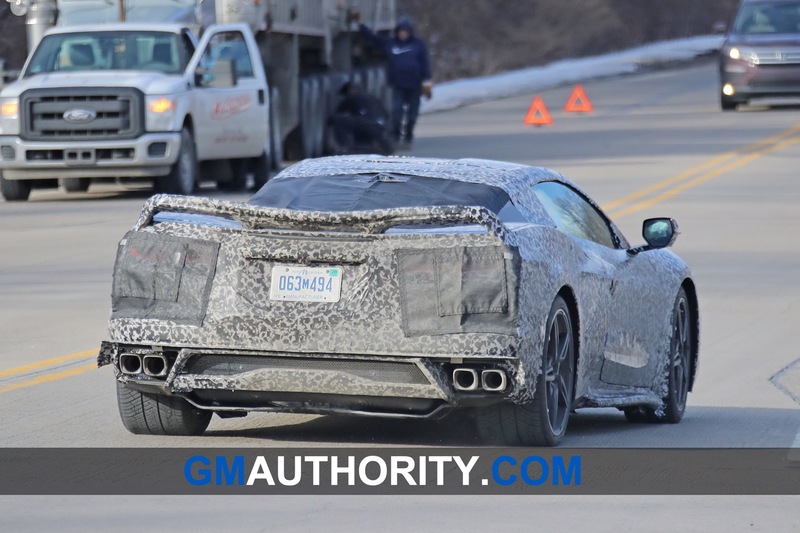 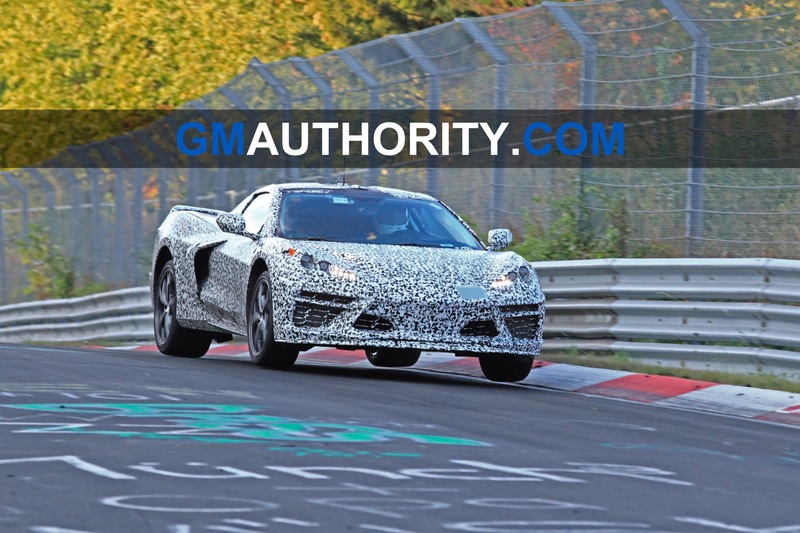 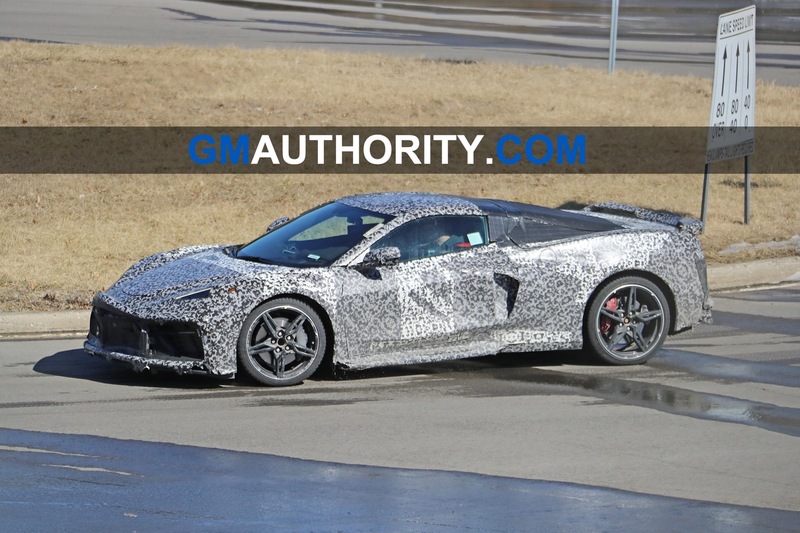 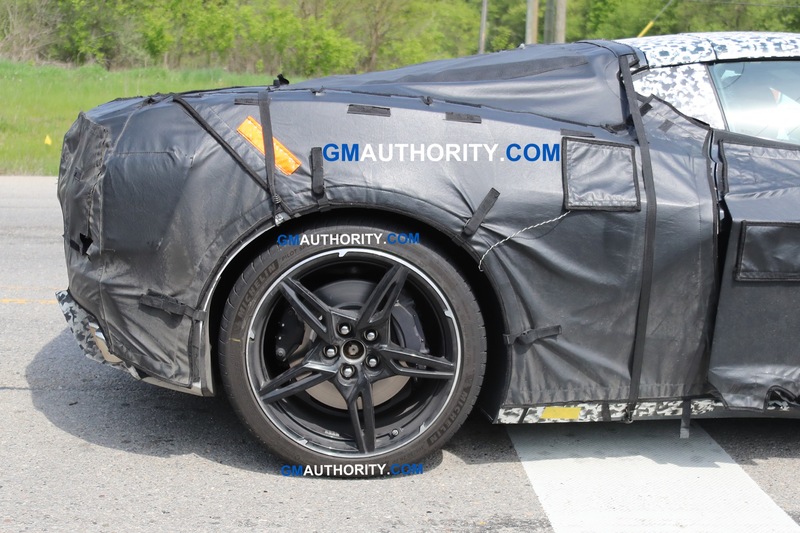 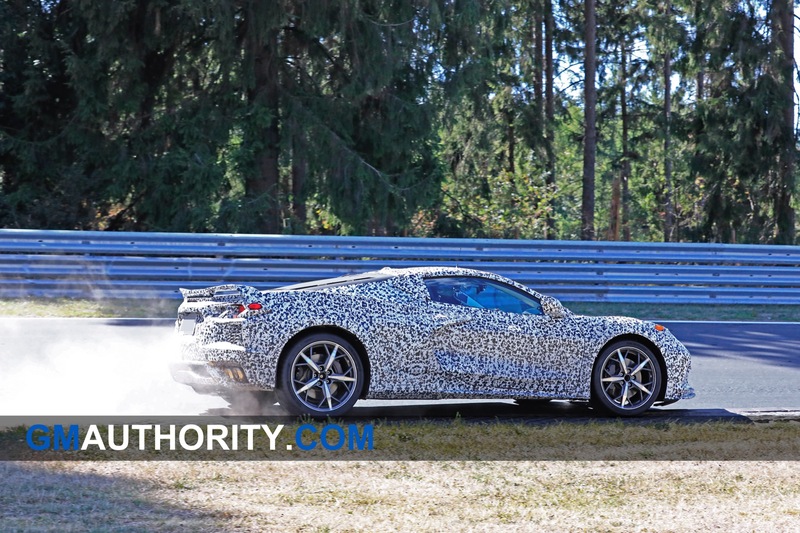 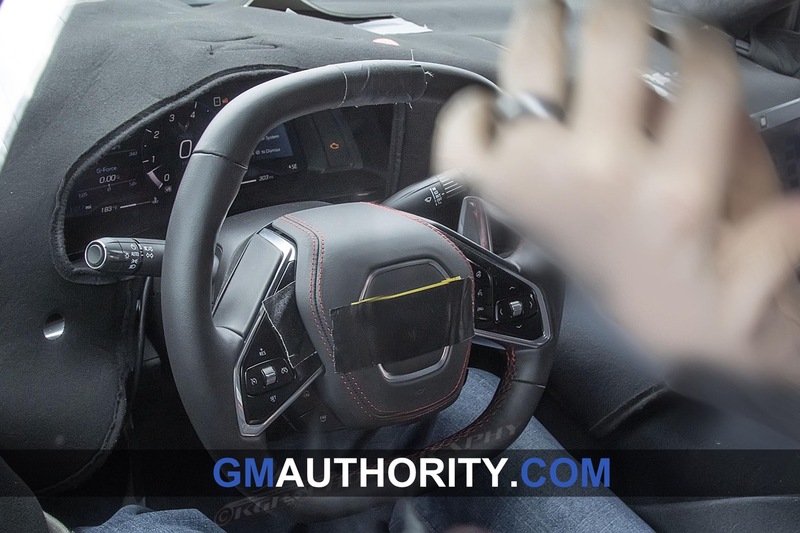 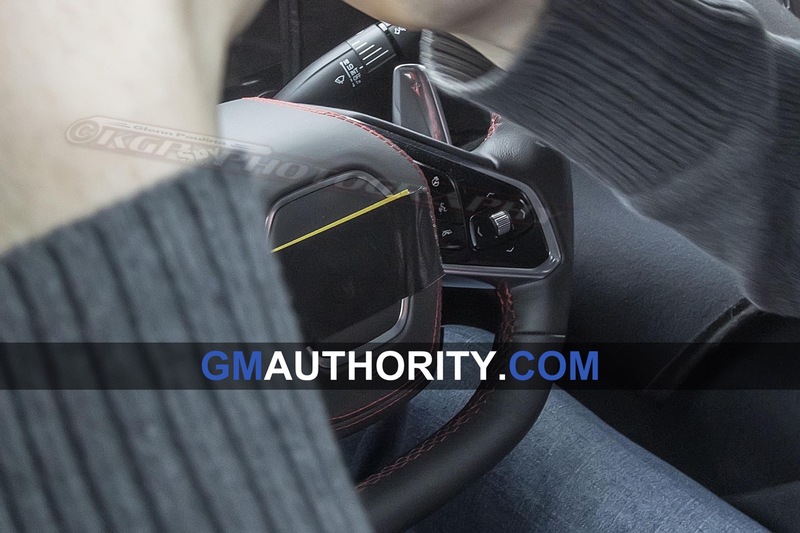 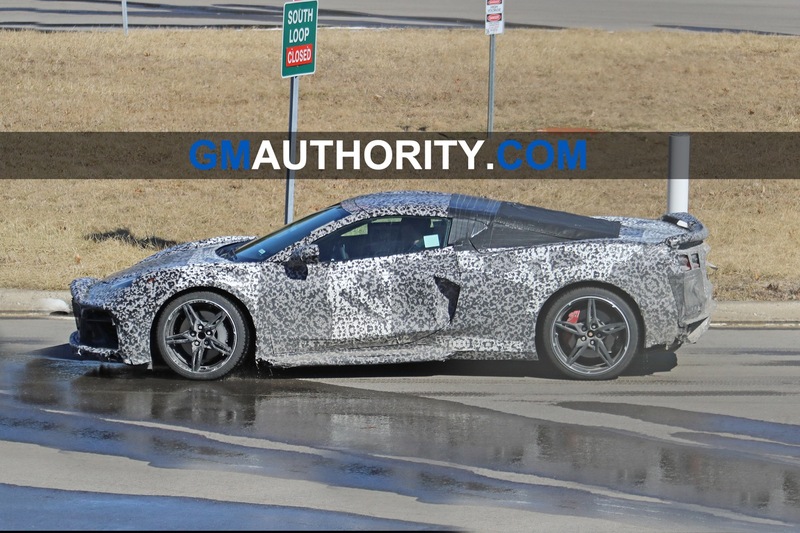 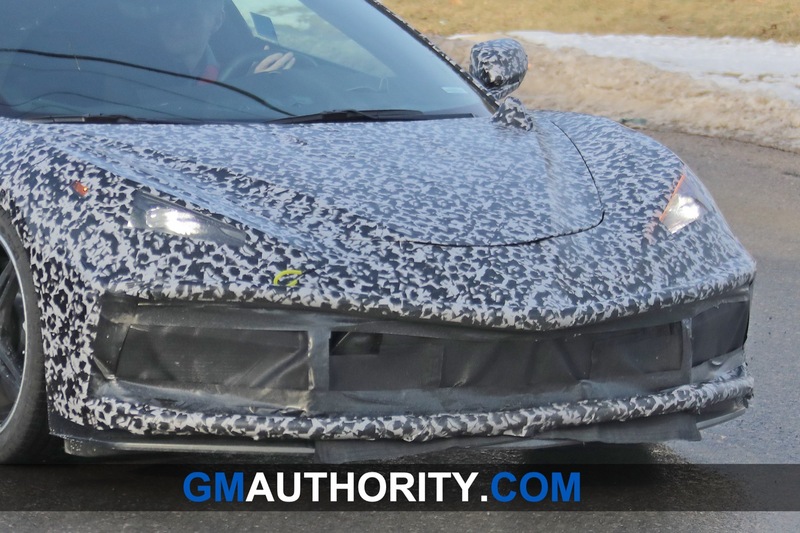 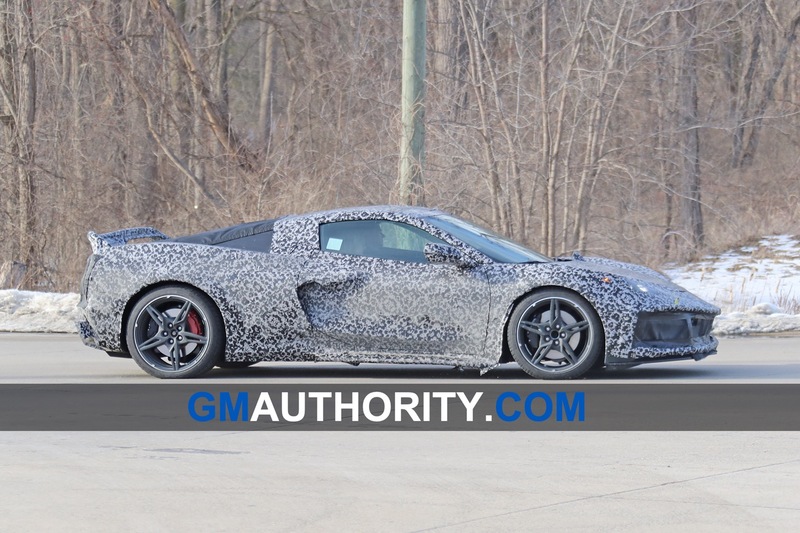 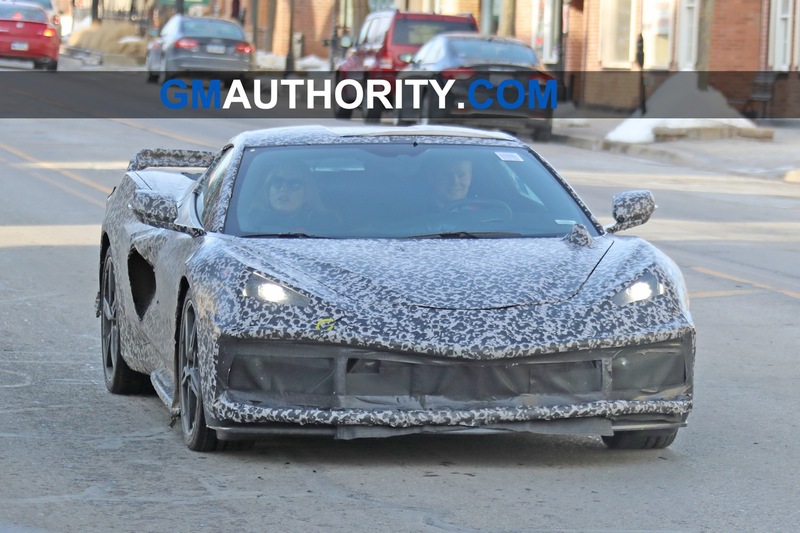 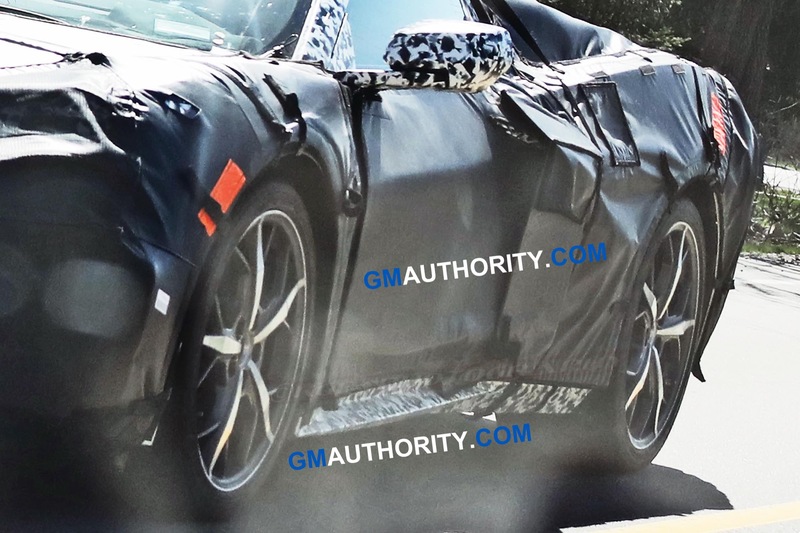 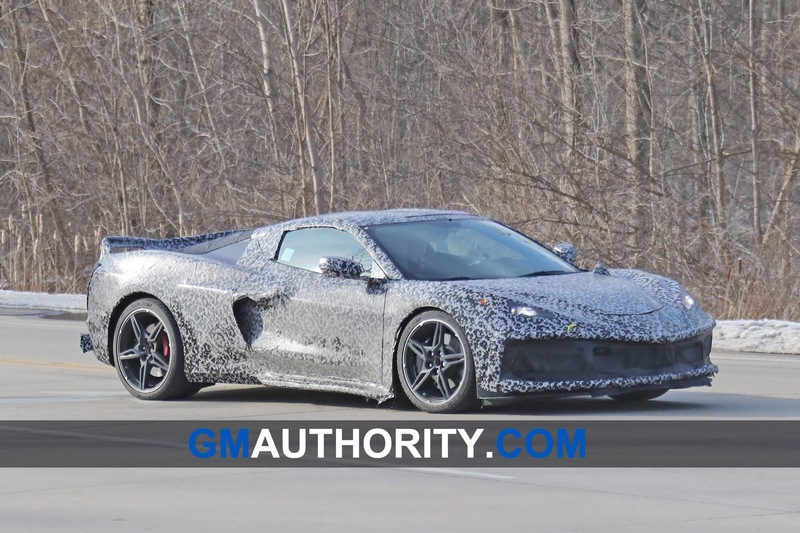 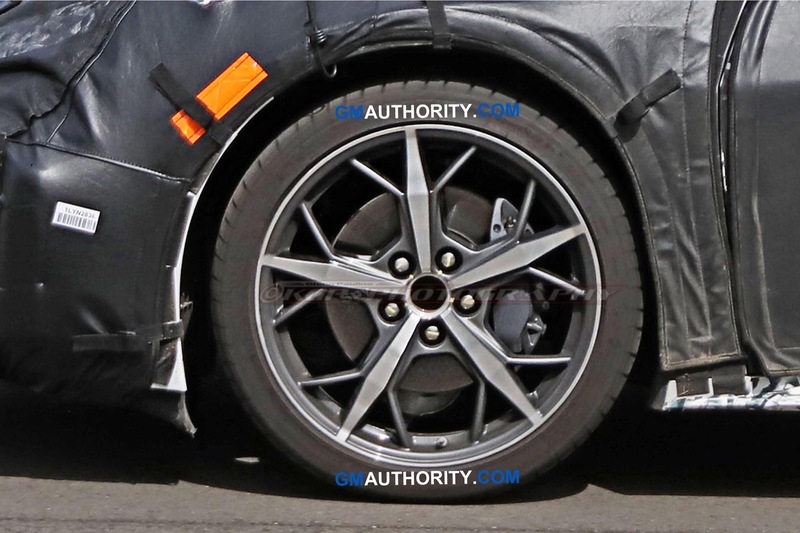 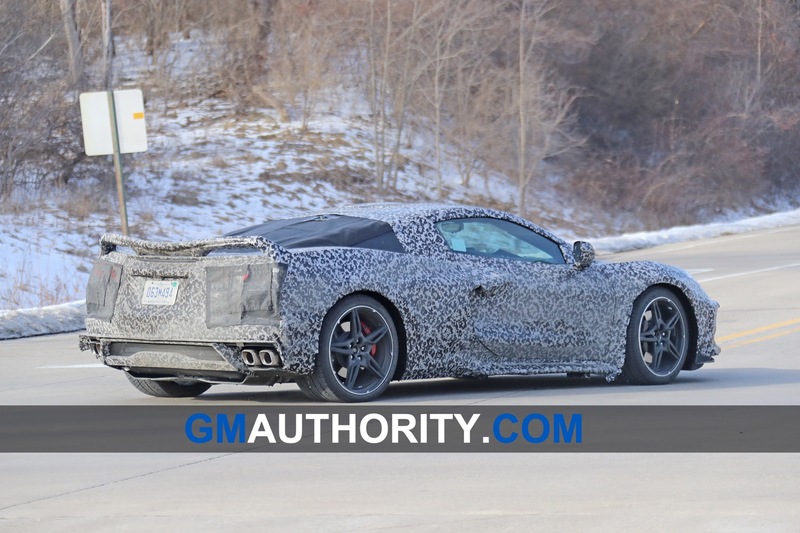 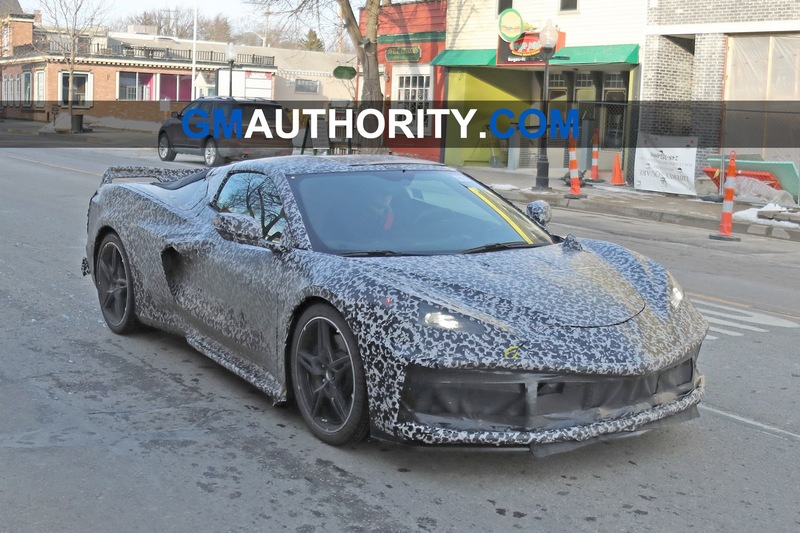 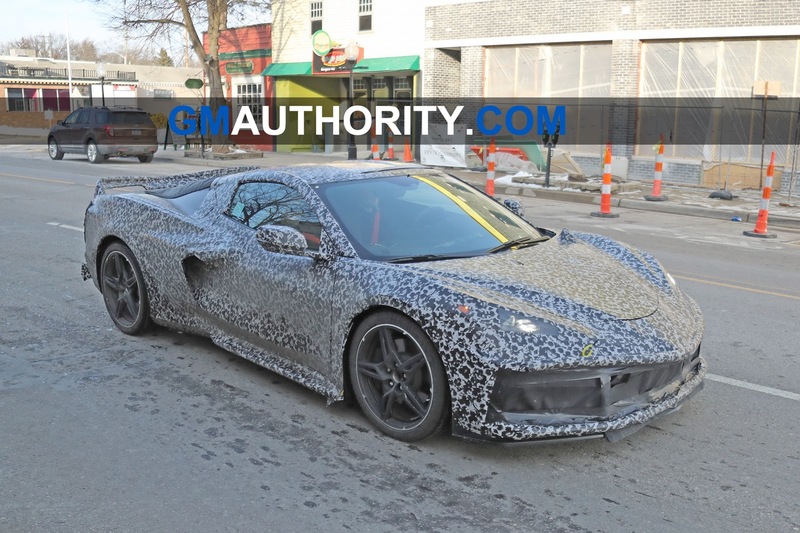 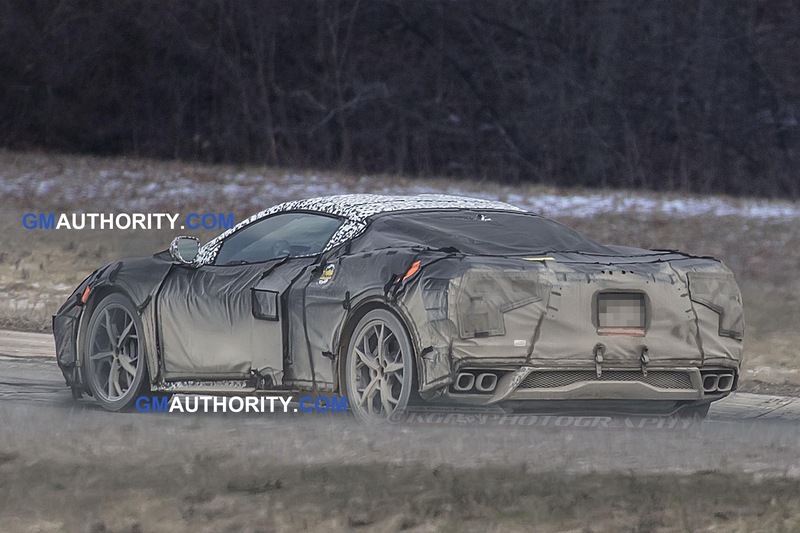 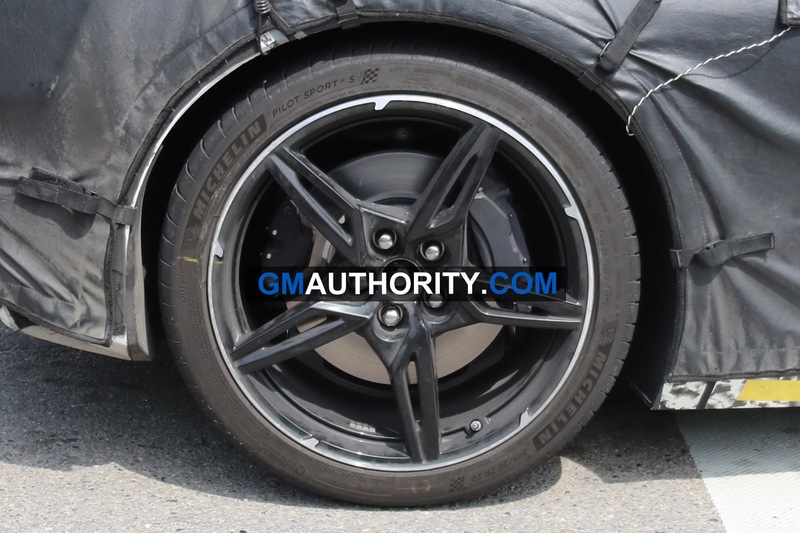 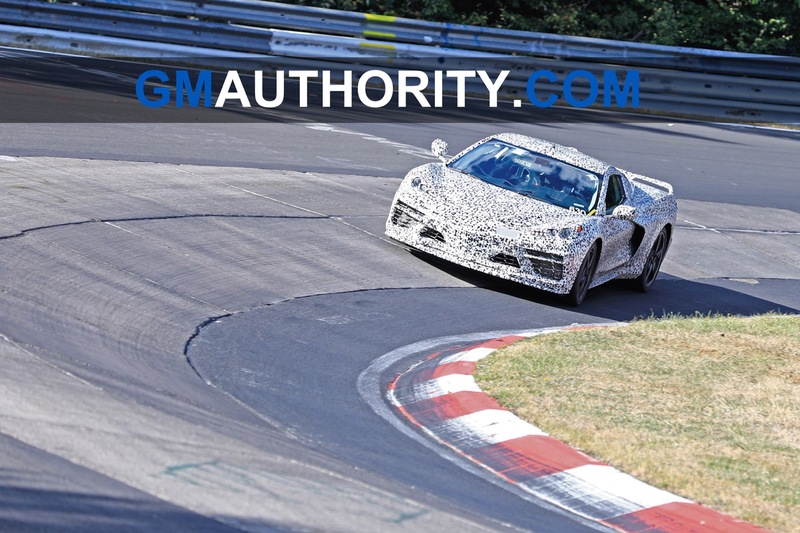 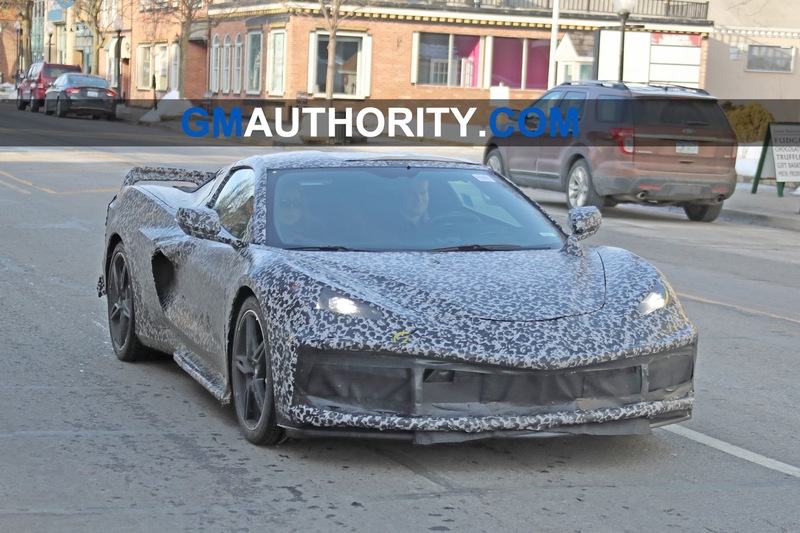 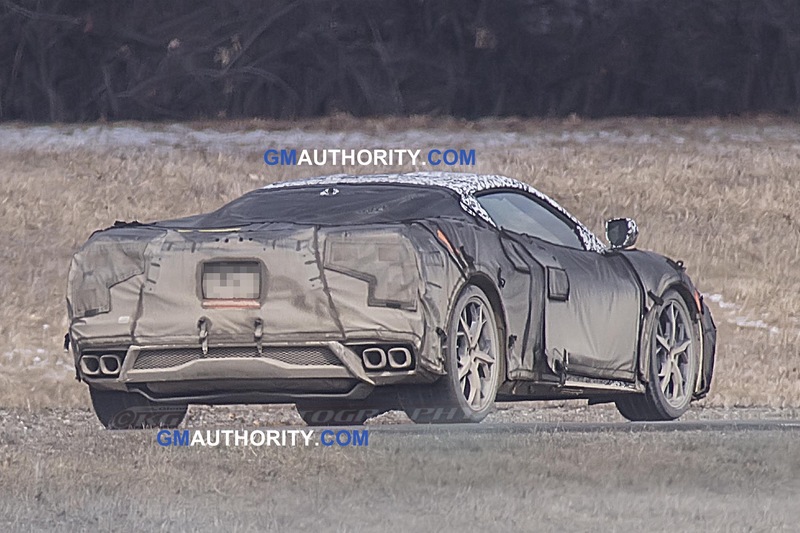 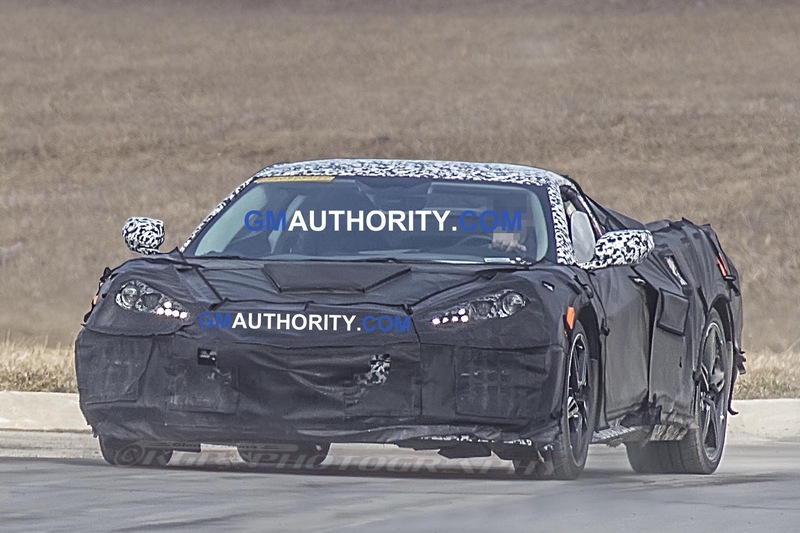 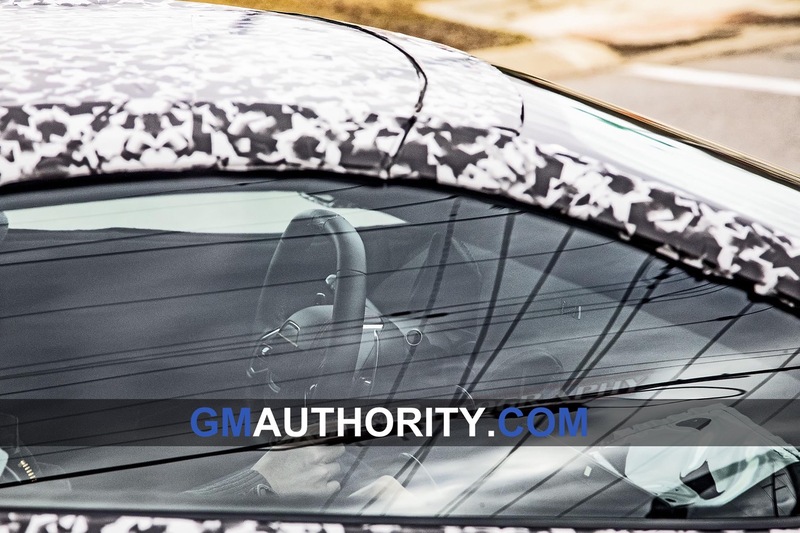 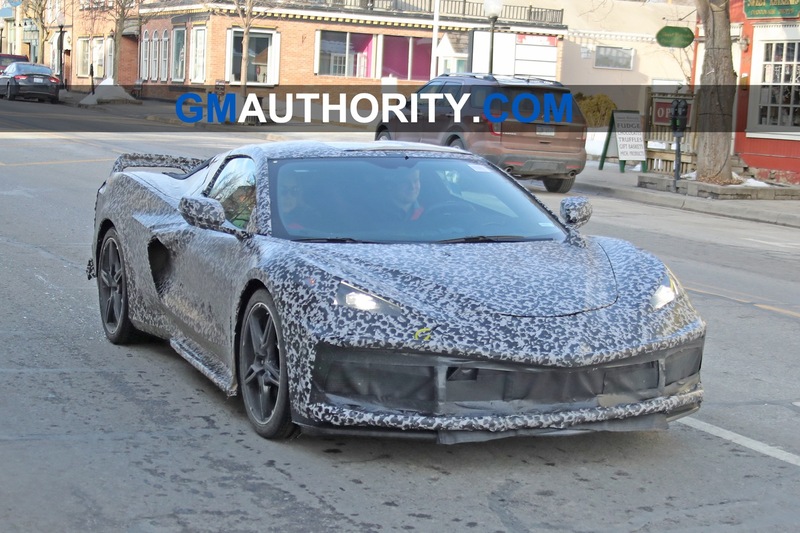 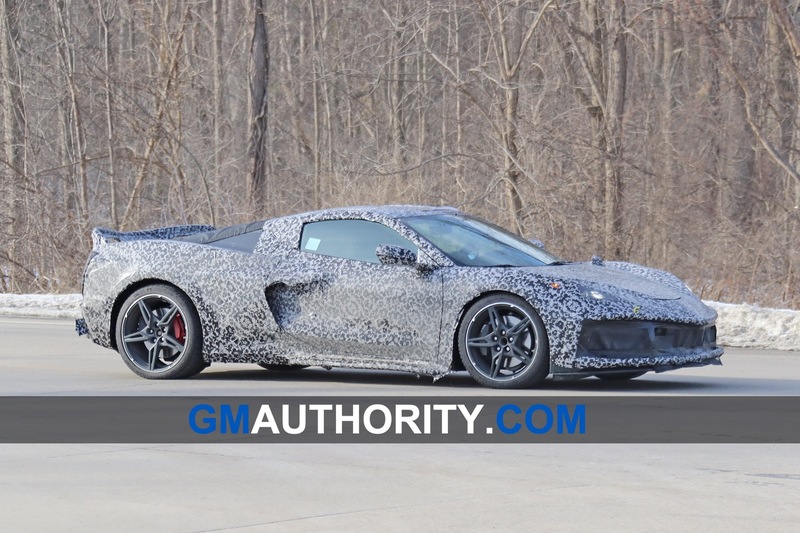 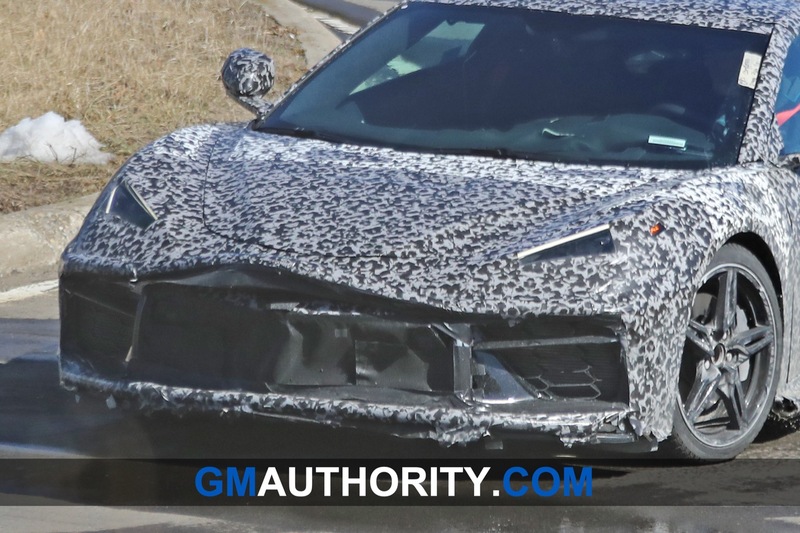 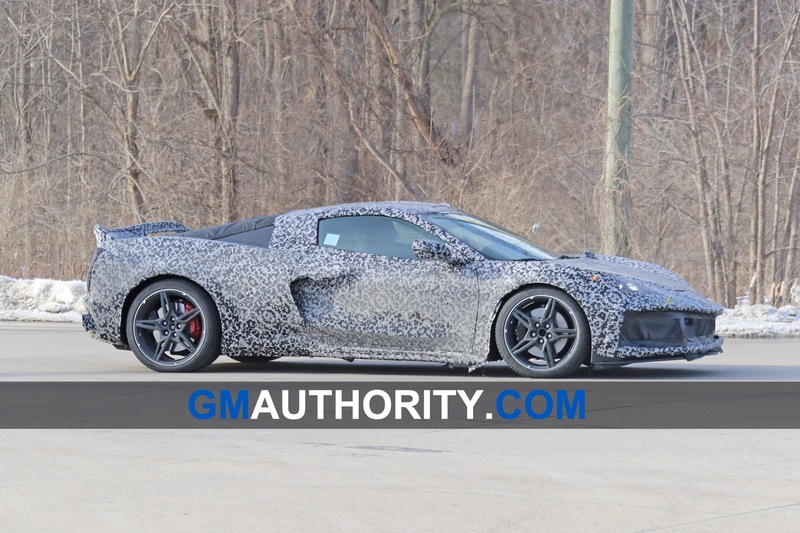 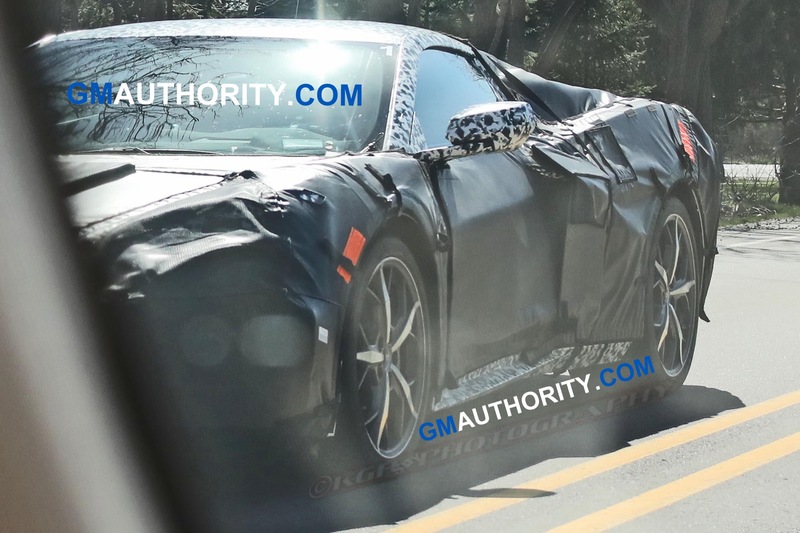 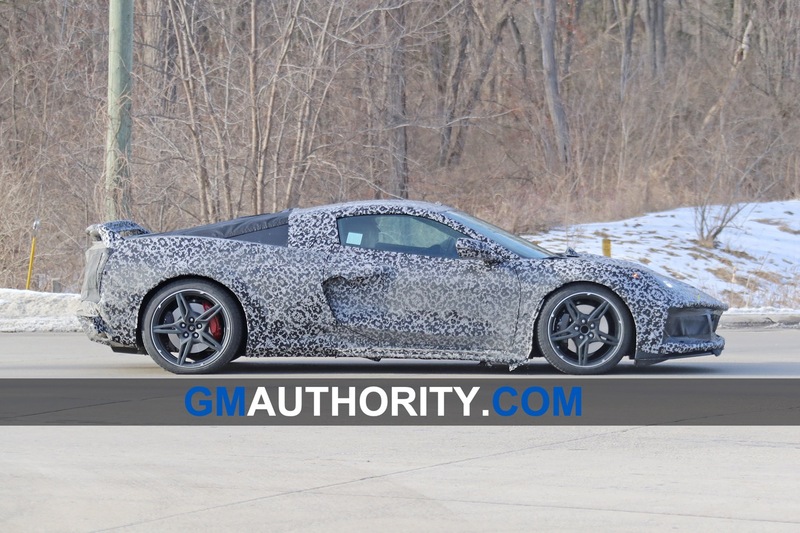 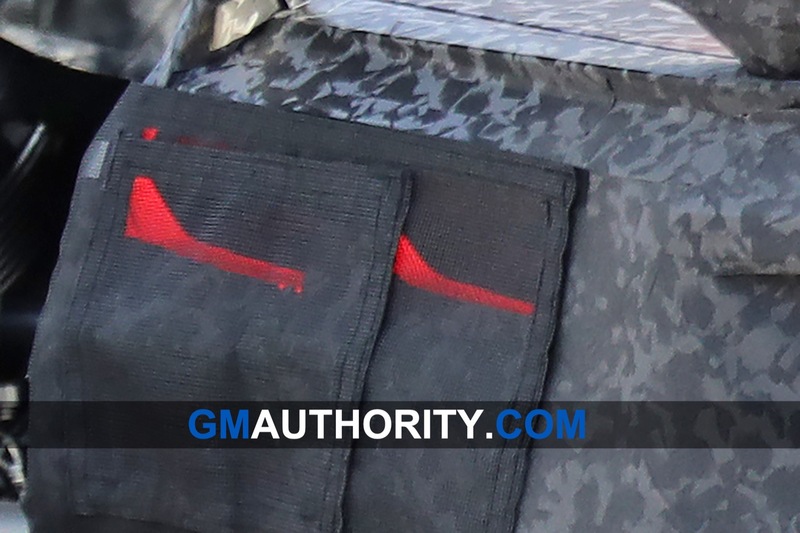 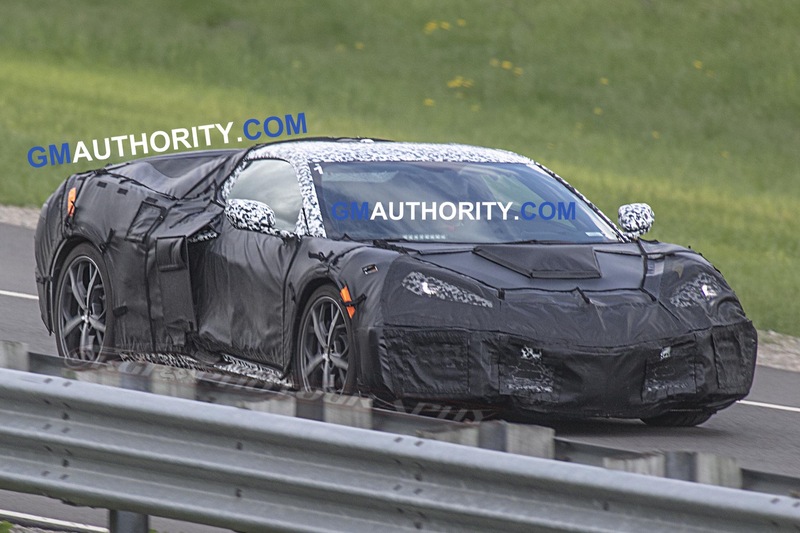 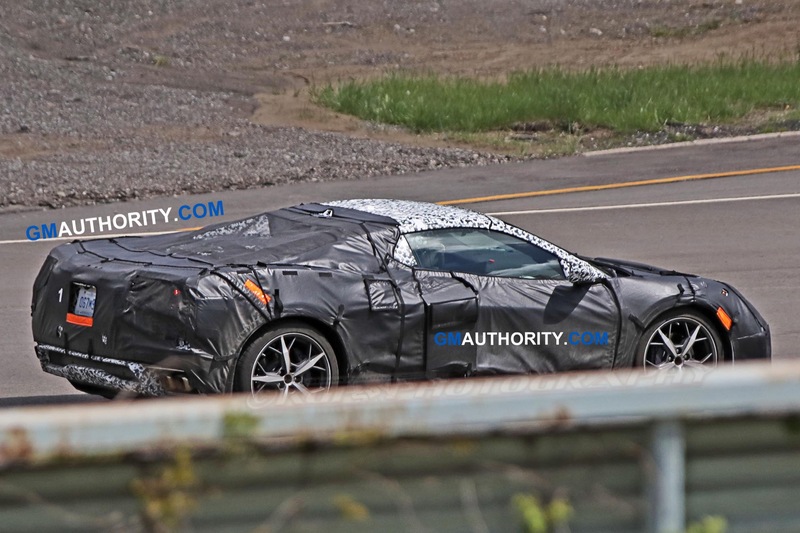 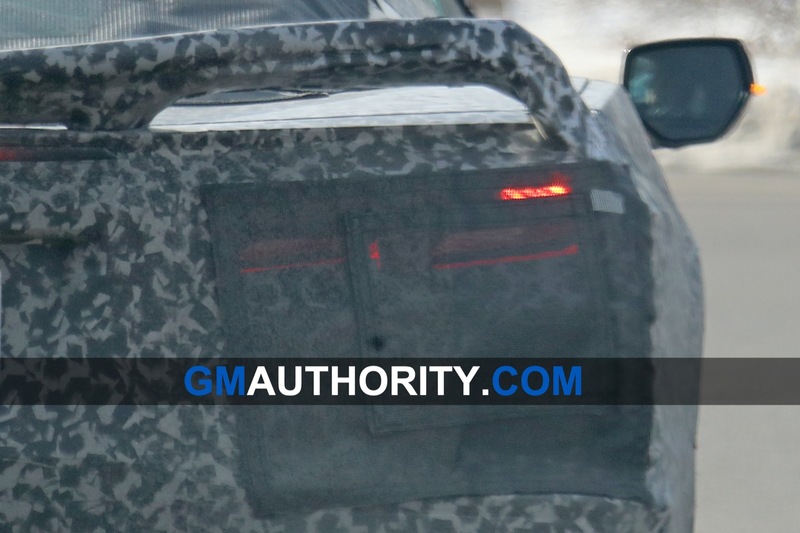 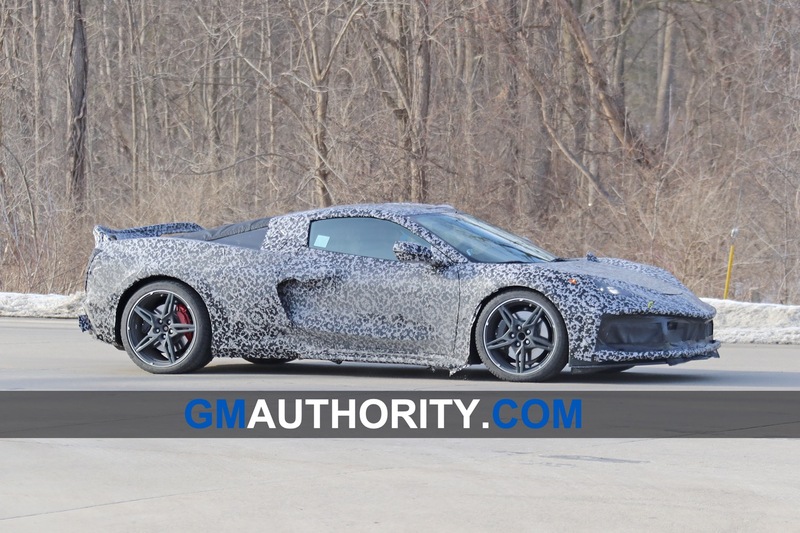 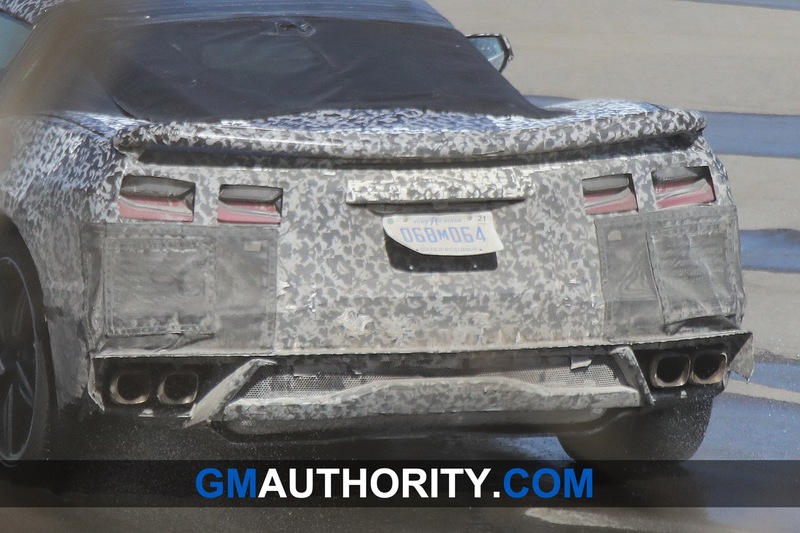 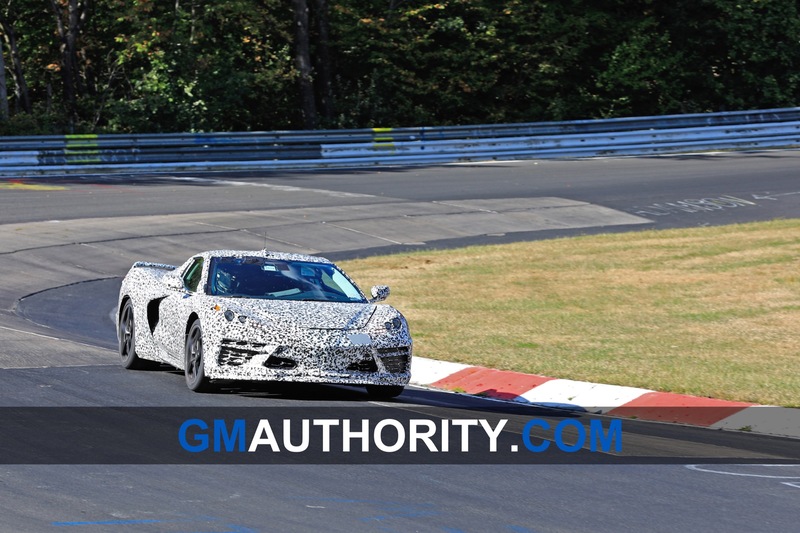 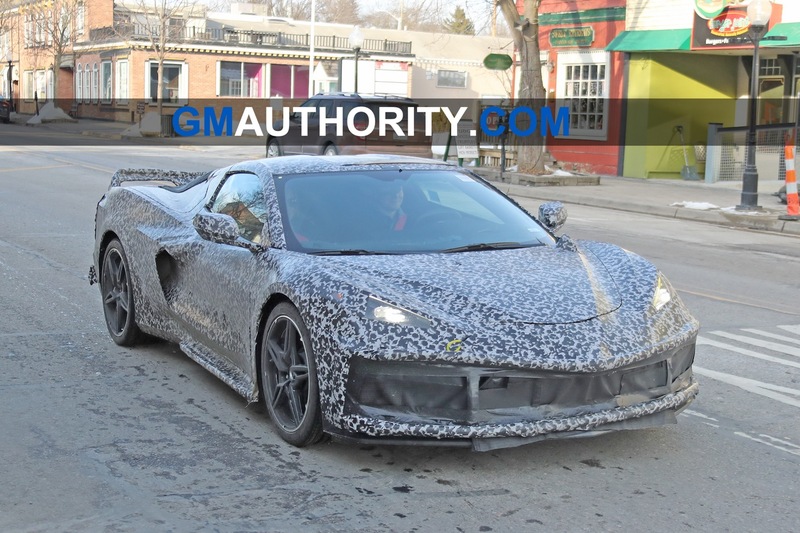 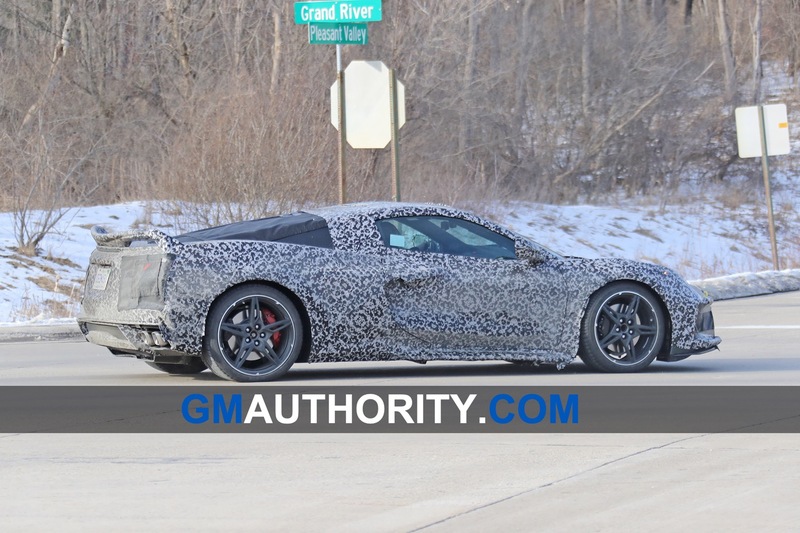 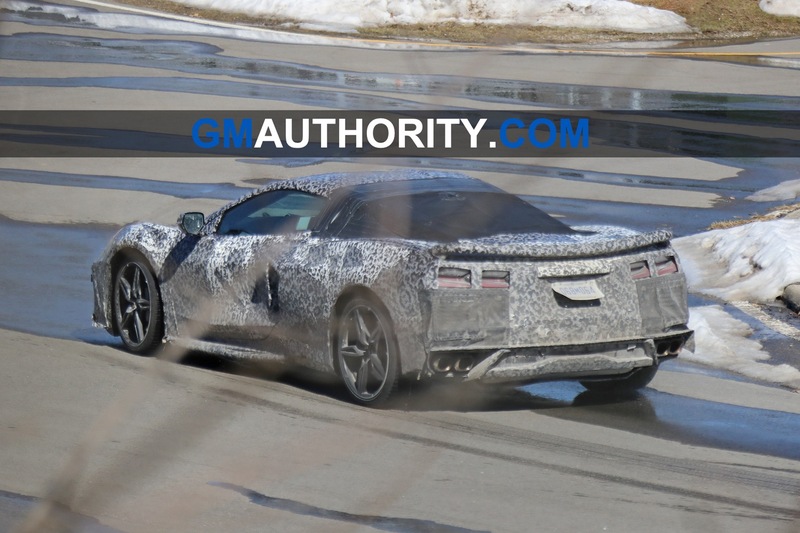 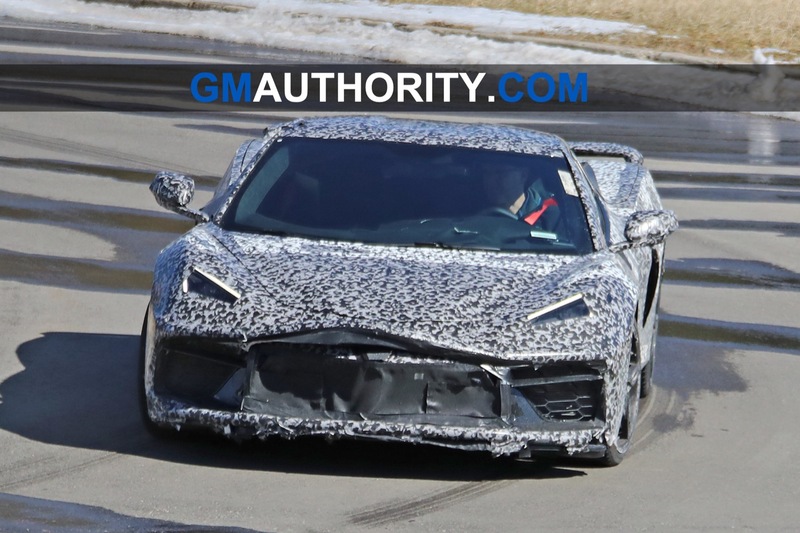 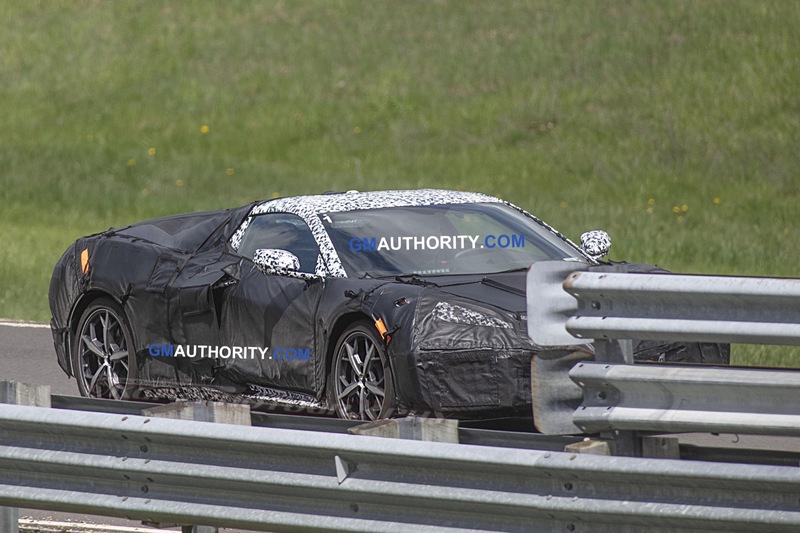 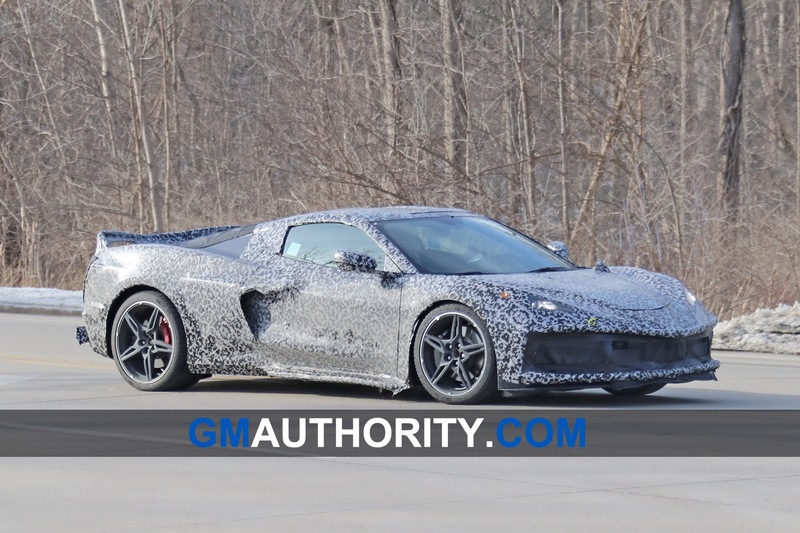 We’ve already seen spy shots of the upcoming mid-engine Corvette various times before, but today’s new photos give us our best look yet at the rear decklid and surrounding area. 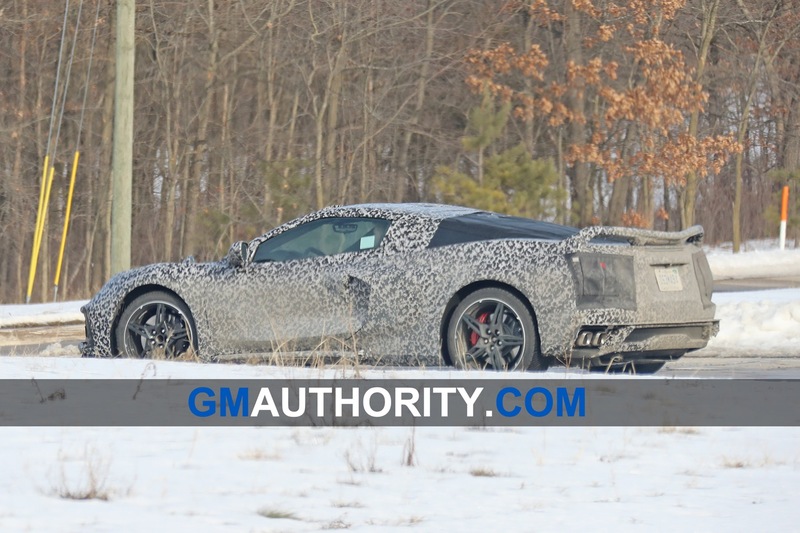 Whereas in previous cases the camouflage managed to cover up a significant amount of the rear, these shots reveal that the mid-engine Vette will not have a sloping rear glass like the current model or other rear-mid-engine supercars such as the Ferrari 488 GTB. 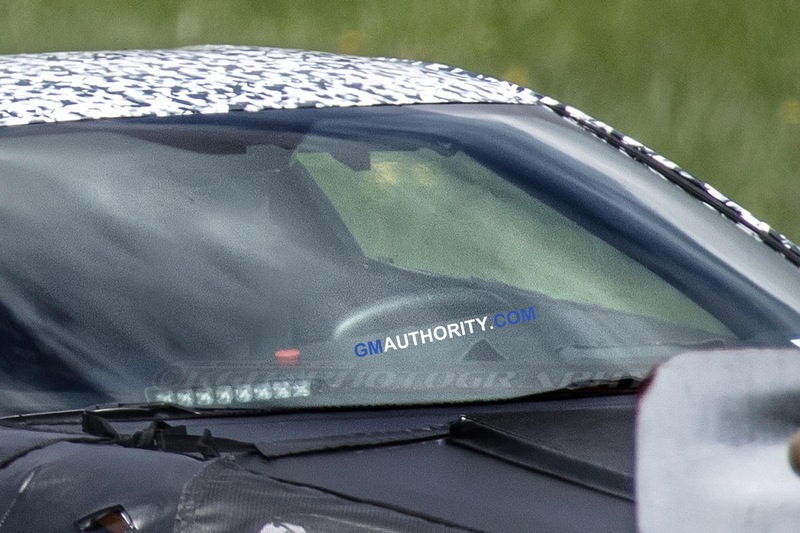 Instead, it will have a rather short vertical window that encloses the cockpit, while two rear buttresses forming the C-pillar. 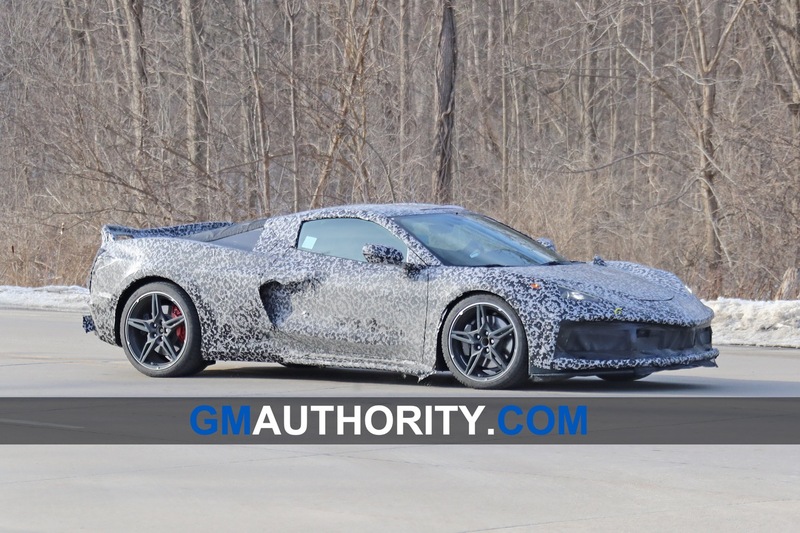 The notion of the mid-engine Corvette not having any glass between the buttresses is supported by the camo drooping between the C-pillars. 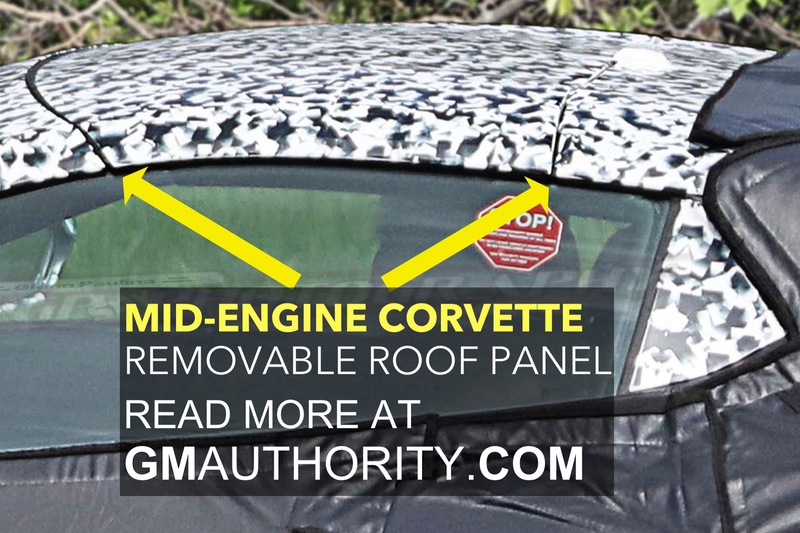 This kind of design enables a flat open-air rear deck design where the entire engine cover is exposed, rather than being closed by a rear glass, allowing the placement of heat-extracting vents which we can also see in the spy photos. 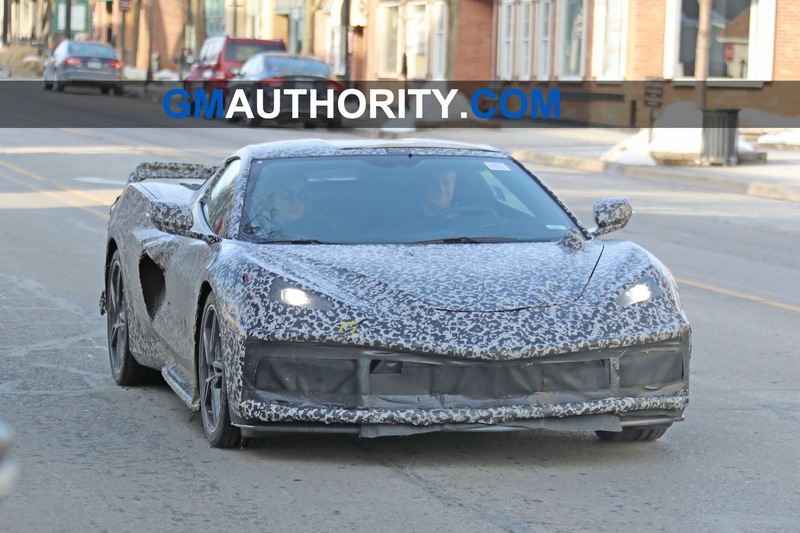 The design rhetoric is similar to the McLaren 570S Coupe or older models such as the Ferrari F355. 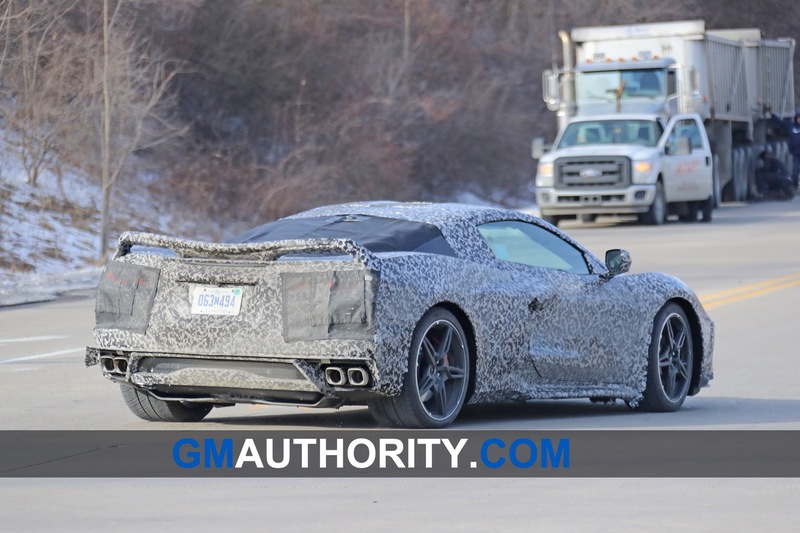 Notably, the C3 Corvette also had buttresses and a small rear window to enclose the cabin. 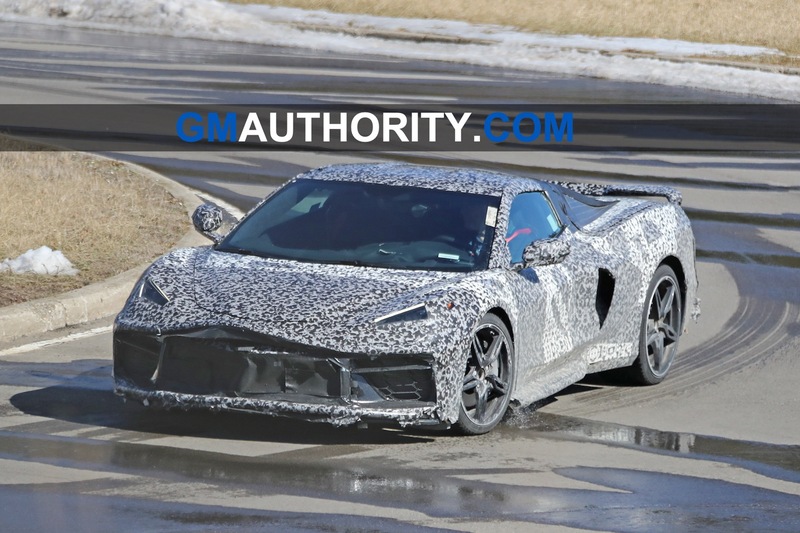 Industry rumblings suggest that during the earliest development stages of the C8 Corvette, engineers and suppliers expressed concerns with managing the immense levels of heat behind the cockpit. 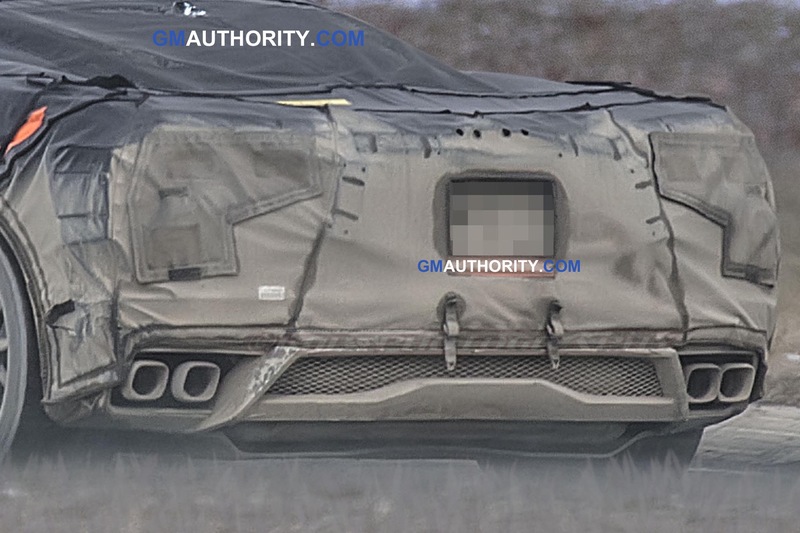 The open-air rear deck design seen on this prototype might be one of the ways in which engineers mitigated the cooling requirements for the rear-mid-engine design. 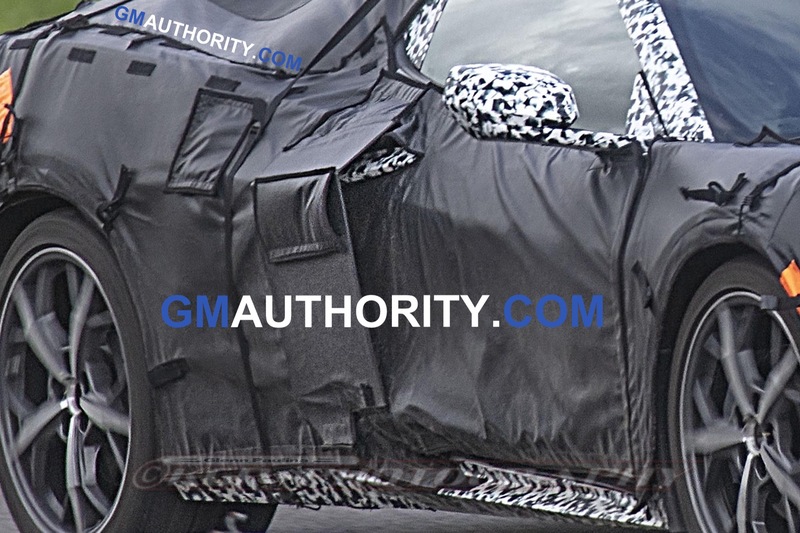 One can never be certain of anything given that this is a prototype and the rear hatch could have been taken off to permit the car to breath given all of the heavy tape that is used to disguise the car. 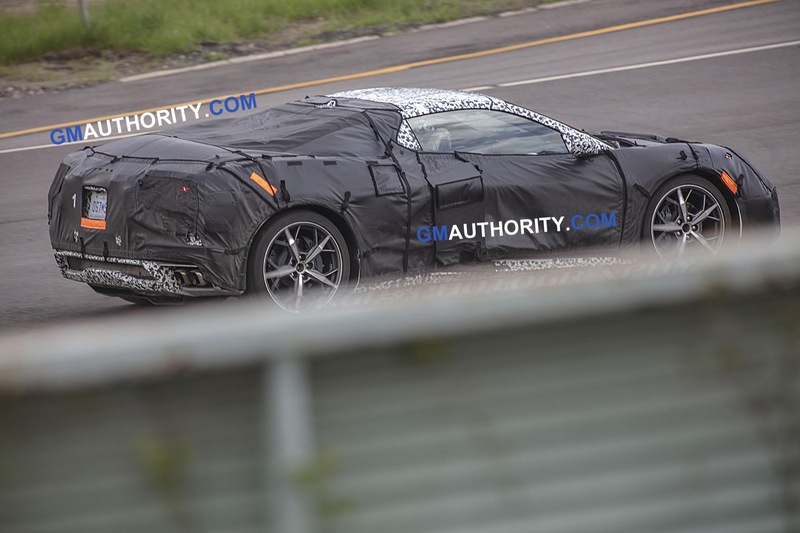 This prototype is so far along that what you are describing is not realistic. 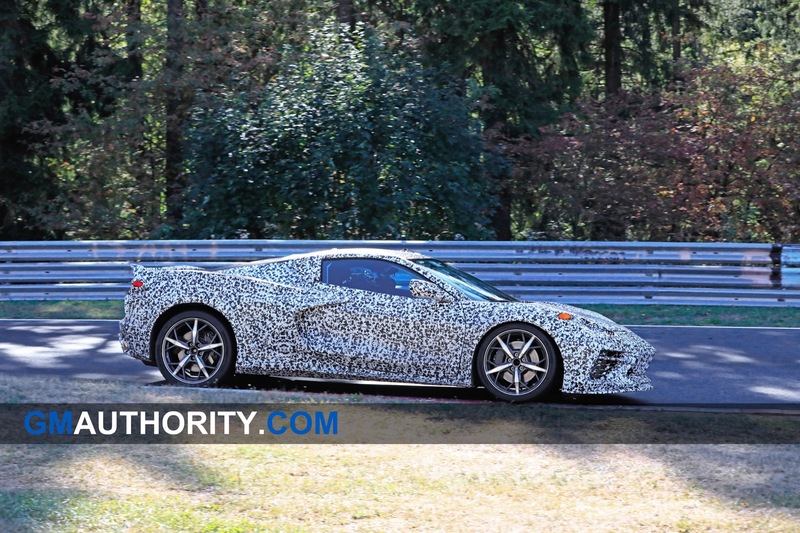 It’s also not realistic that a feature be built in specifically for testing… so yes, we can be certain. 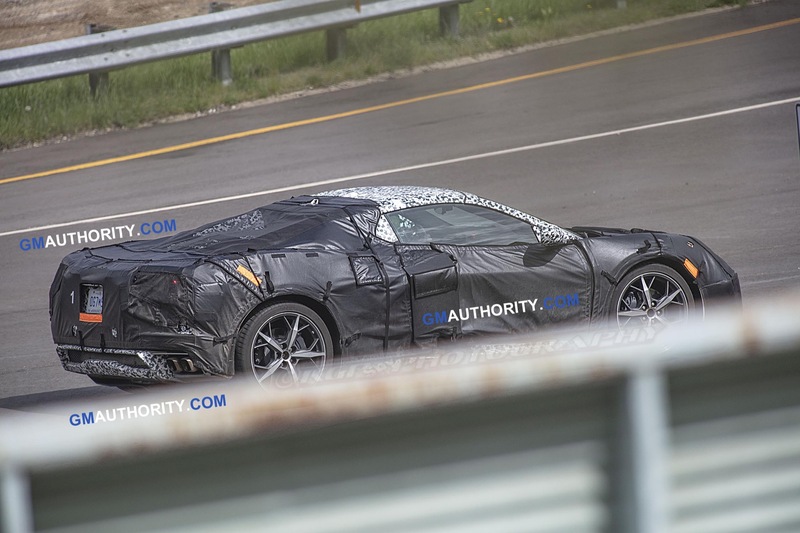 I love what I see so far has a real super car look to it already. 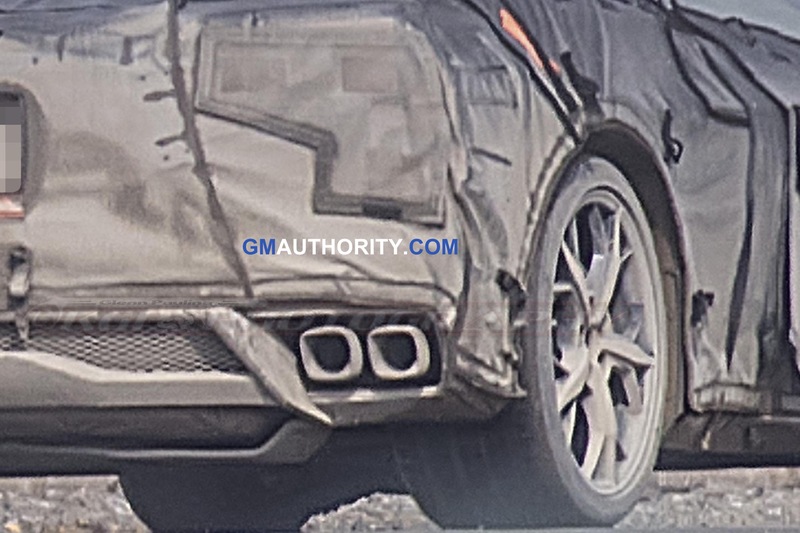 From the leaked front and rear bumpers from the factory it’s gonna look menacing. 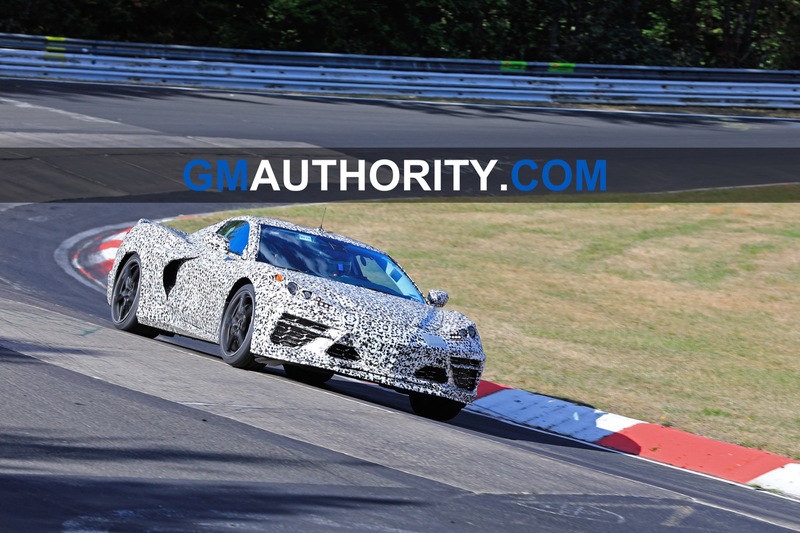 And from the little I can see…. 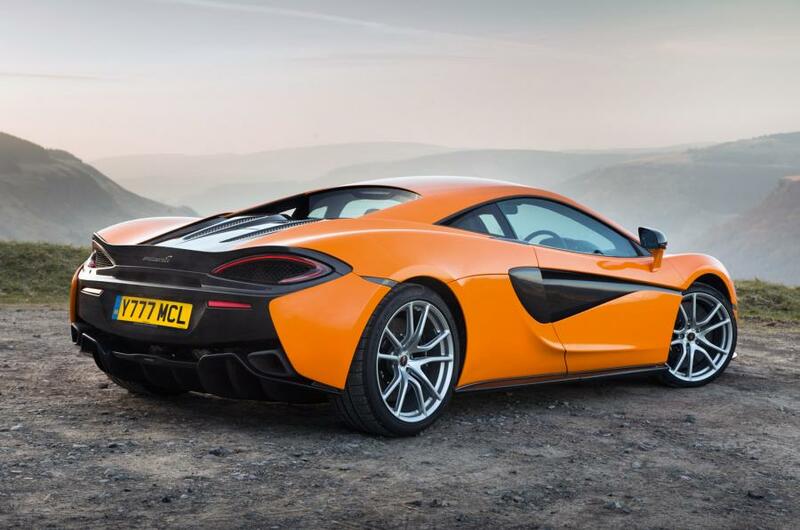 just my opinion I may be way off the buttress’ look more like the 570 spider as there rounded . 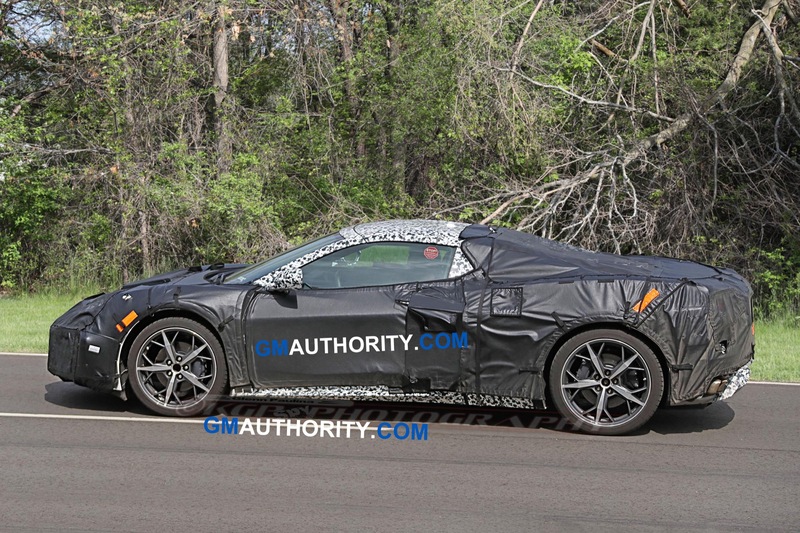 Do you think this may be a convertible version ? 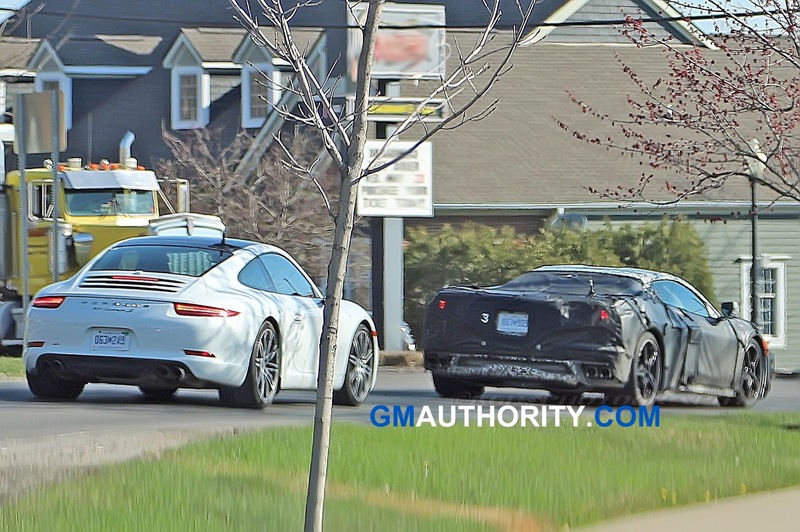 Pretty much expected this and could see it in the making for a while. 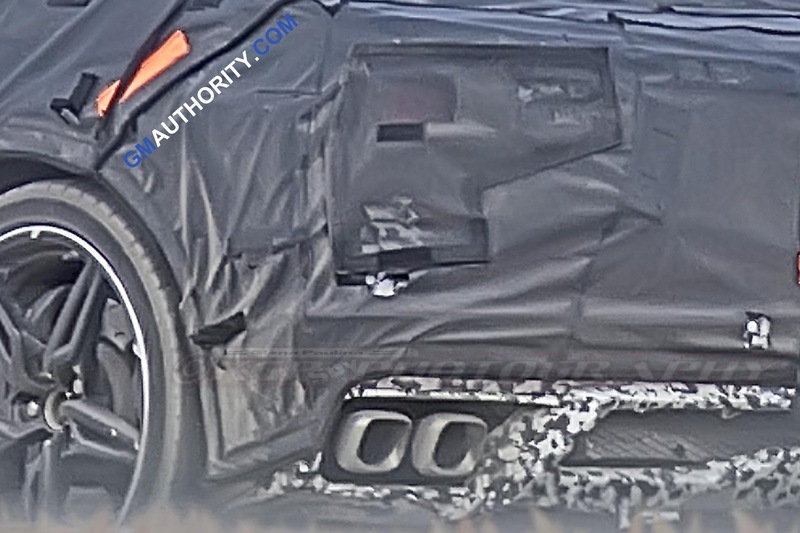 Most of the cars with larger engine have a good deal of venting and open air. 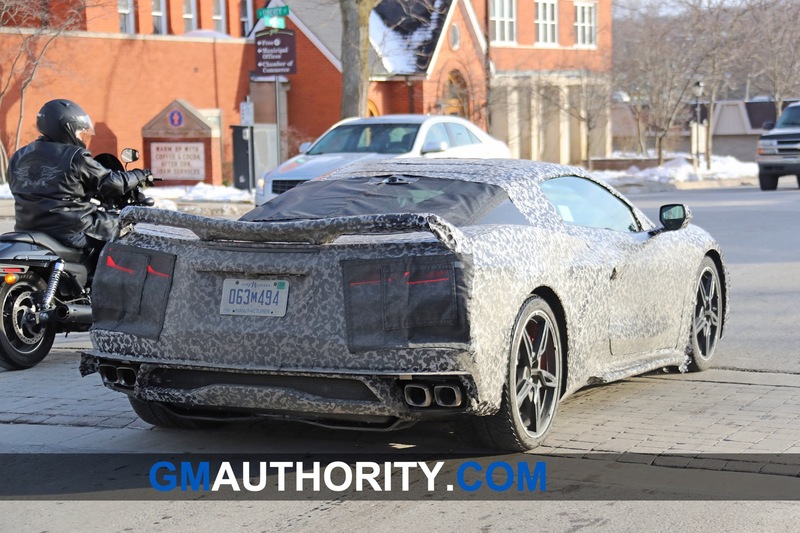 I own a mid engine and can attest to the great amount of heat generated even by a smaller engine. 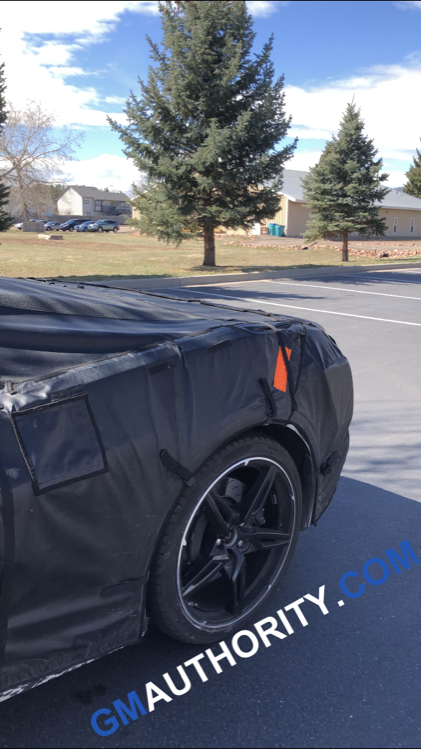 You don’t haul ice cream in the trunk. 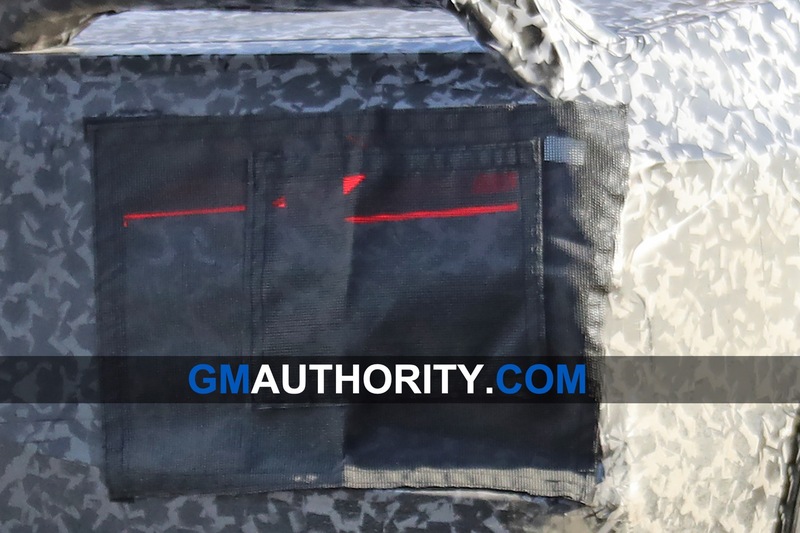 The electronics are the real issue as heat kills them so look for them to additional cooling internally. 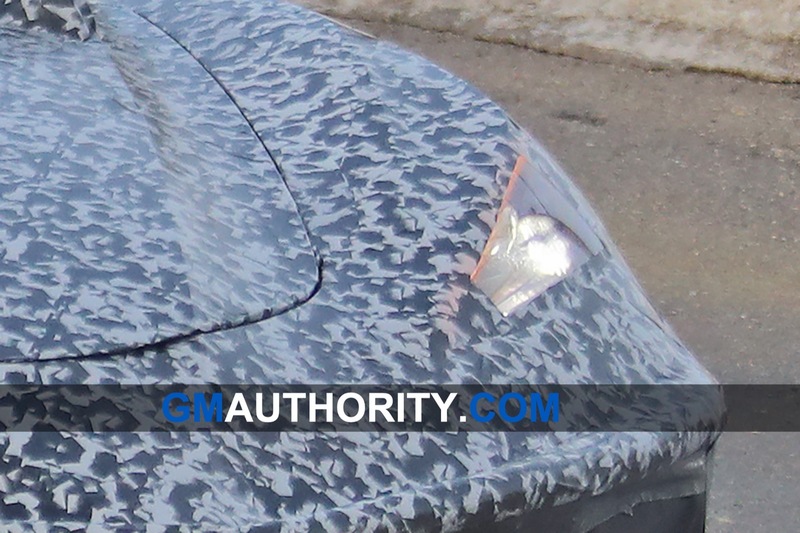 Mine has an electric fan blowing on coil and alternator. 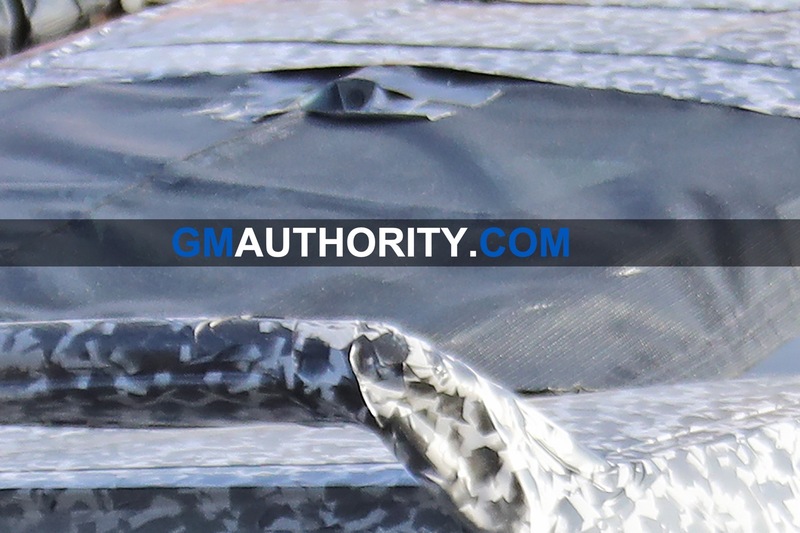 The nose should also have a vent to relieve the high pressure build up and aide in cooling. 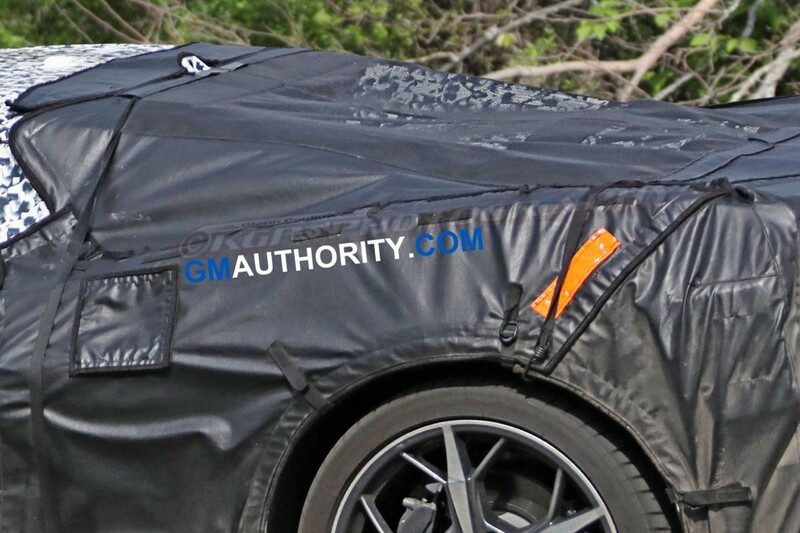 Note the hood here fans a cover and vent. 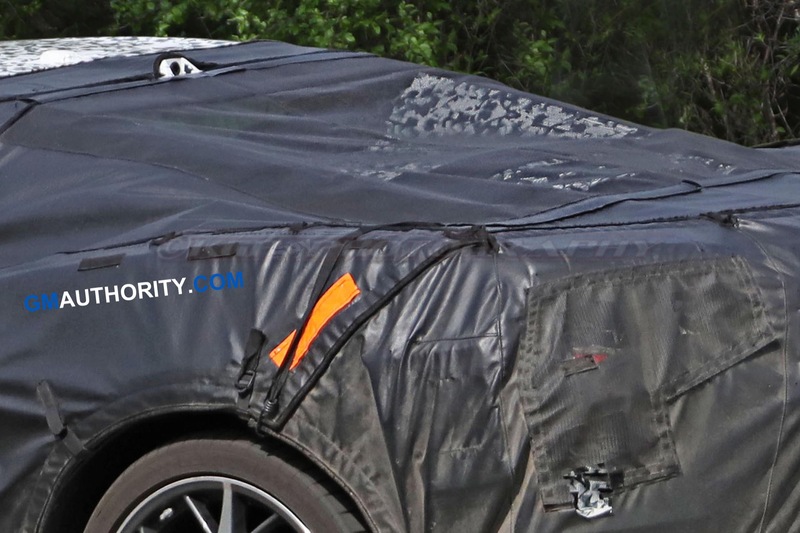 Lols are it has a much larger vent under the cover. 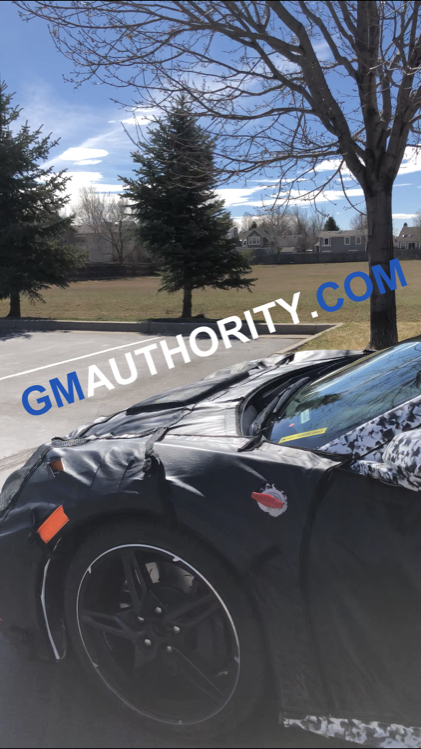 I have a hood vent on mine and it really works even on the street. 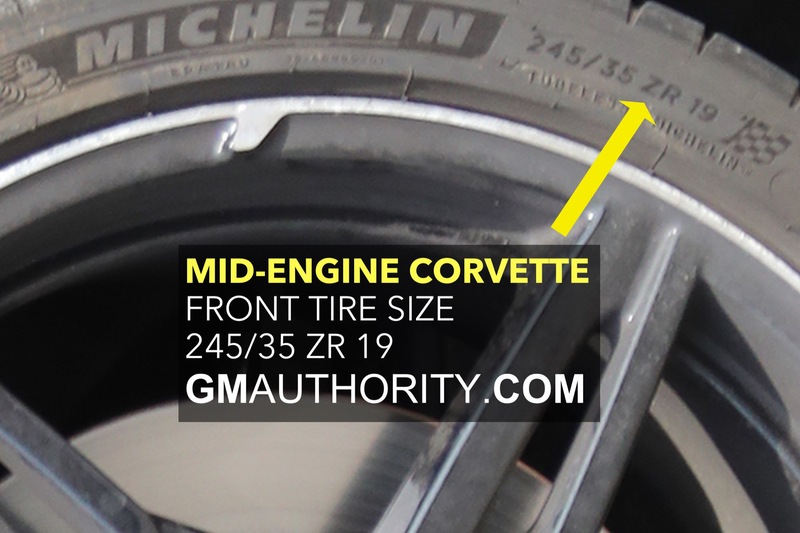 It also provides. 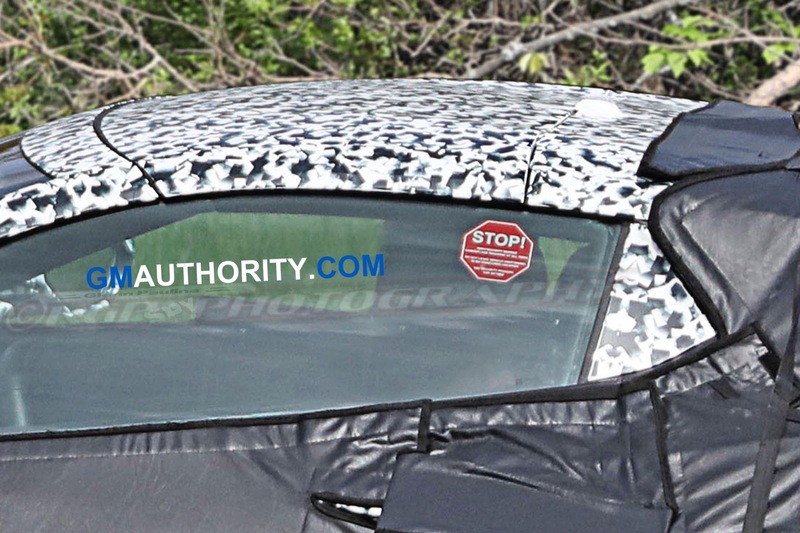 Vented air that makes a heck of a bug deflector for the wind shield as a unintended side effect. 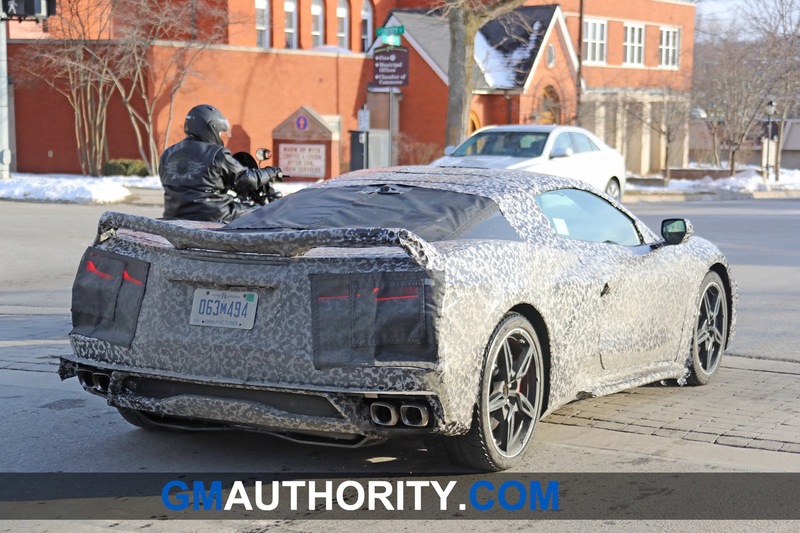 Hey Scott when you mentioned blower on dist and alt I knew it. 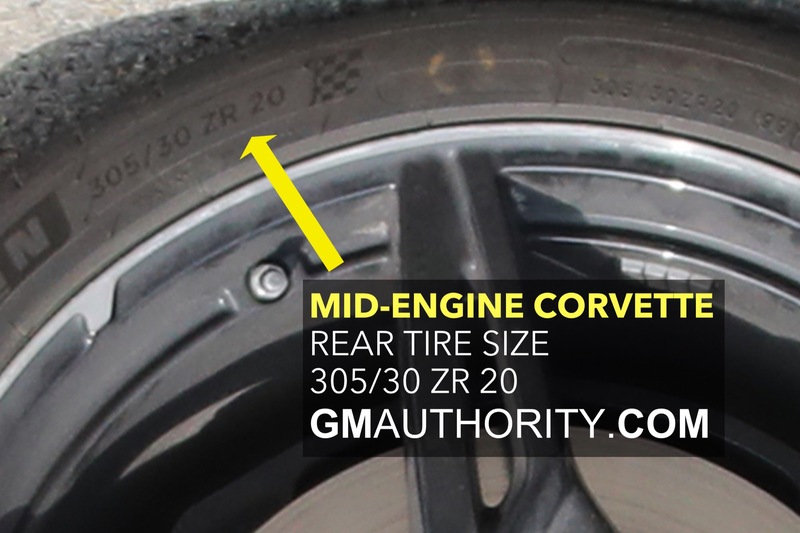 LOL I have had 2 of them. 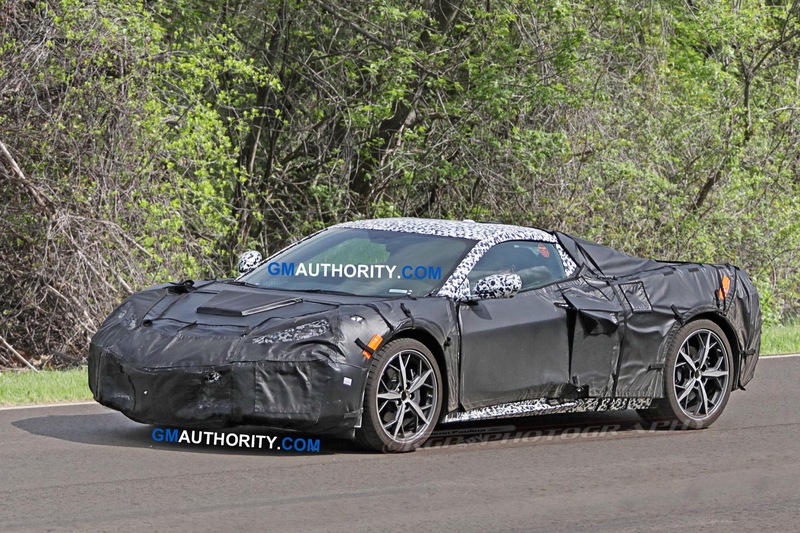 1 88 with 4 Cyl and 87 with 3800SC. 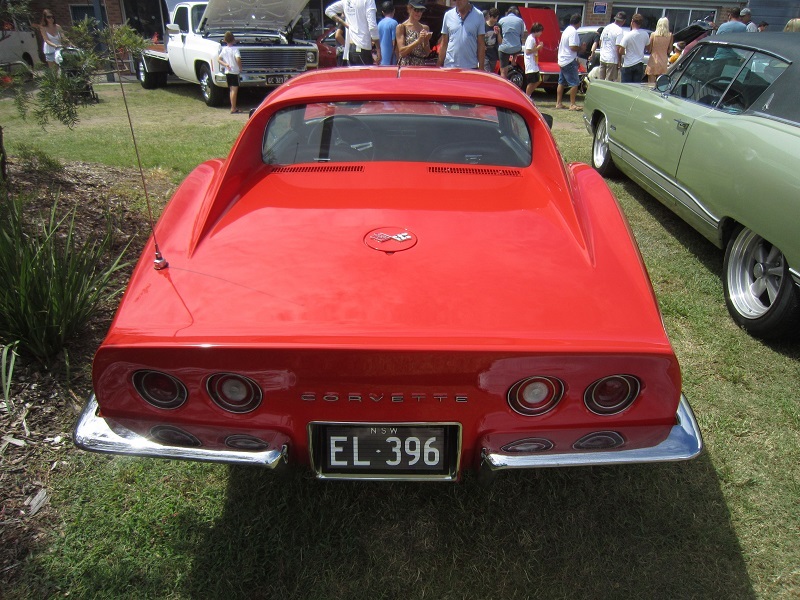 Recently sold the 3800SC. 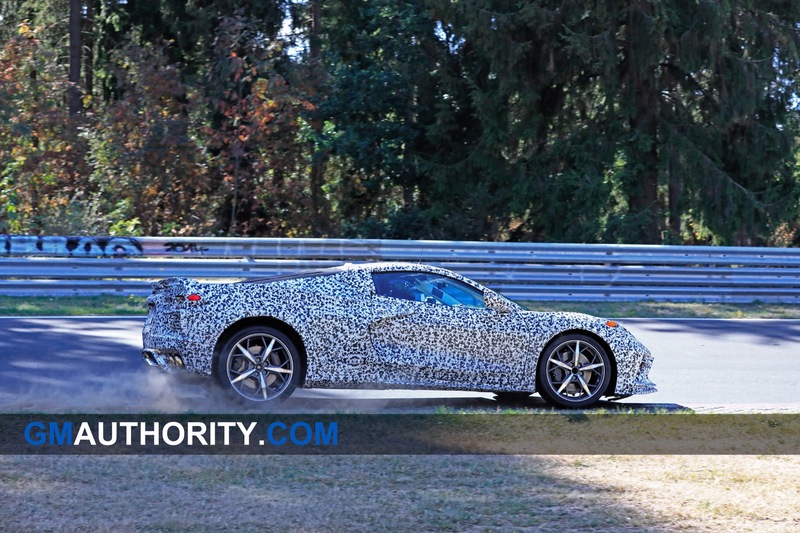 Sure miss them! 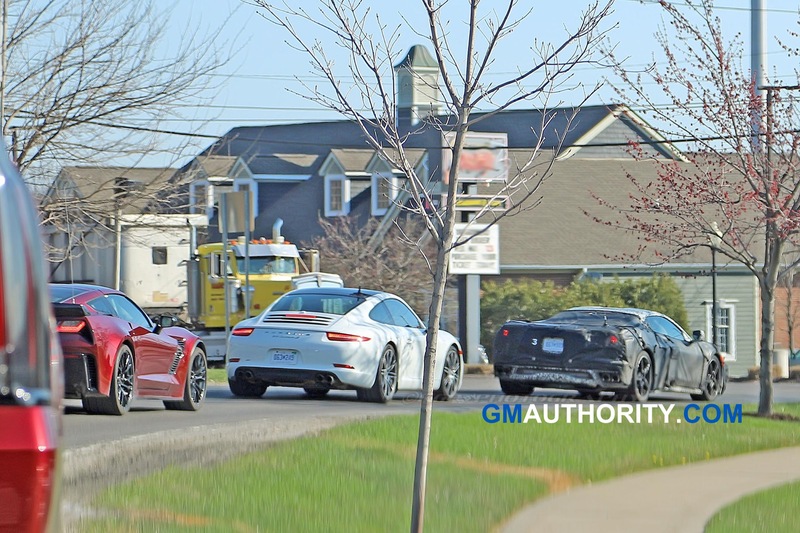 Just gotta get one again. 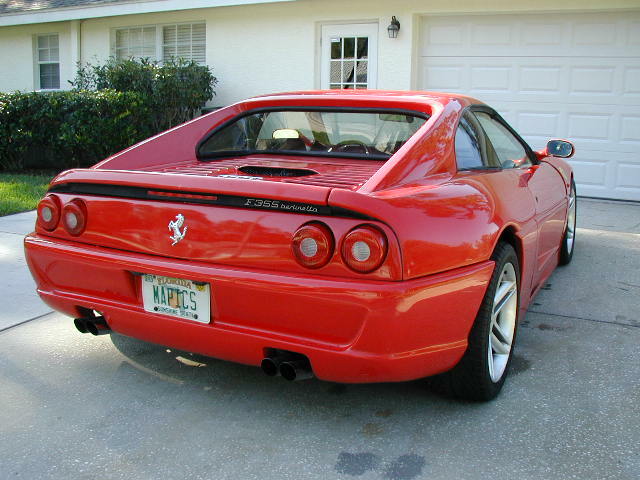 Driving a stinkin turbo 4 banger FWD just doesnt have the acceleration of the 3800SC nor that sweet whine! 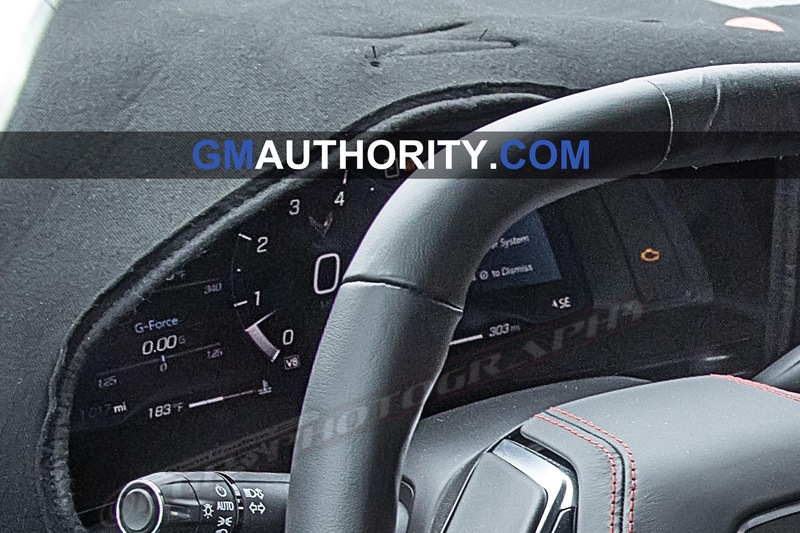 The GMC profiling shtick is going a little overboard now. 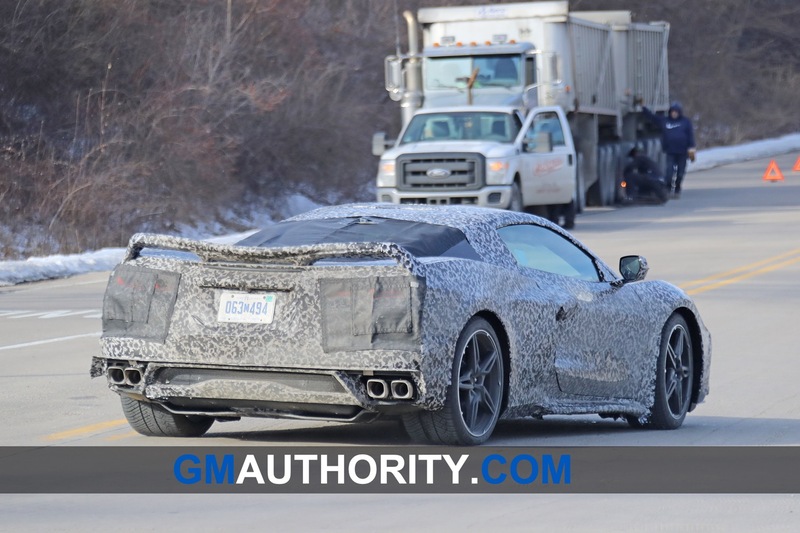 The ‘I’m a GMC guy but hey look I bought a Chevy’ was a nice touch though. 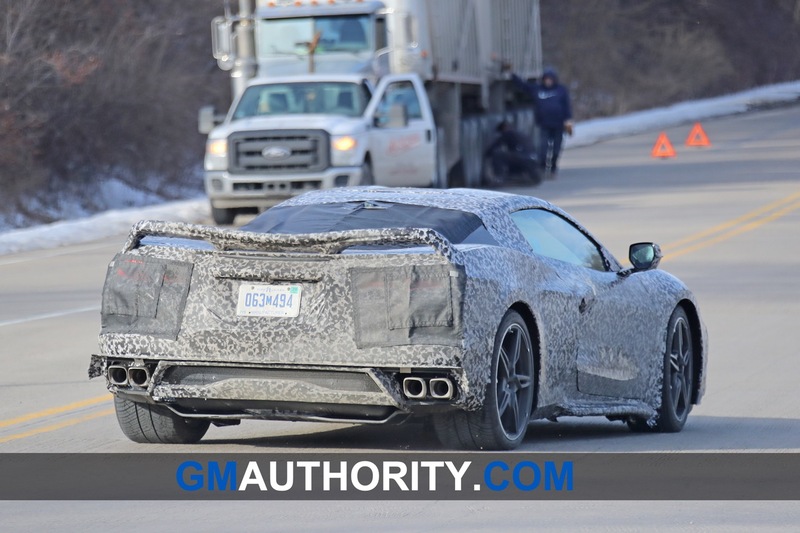 Why wouldn’t Cadillac get the super car? 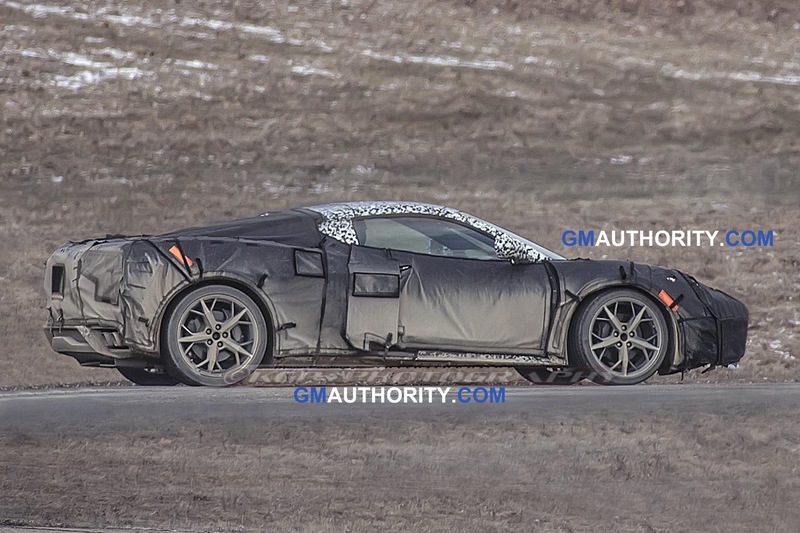 This makes no sense. 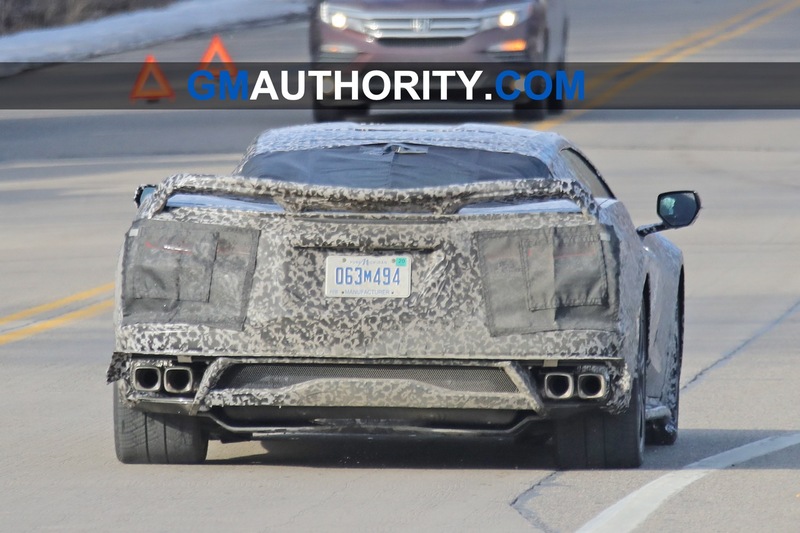 My guess is that Cadillac is not ready for a supercar….. yet. 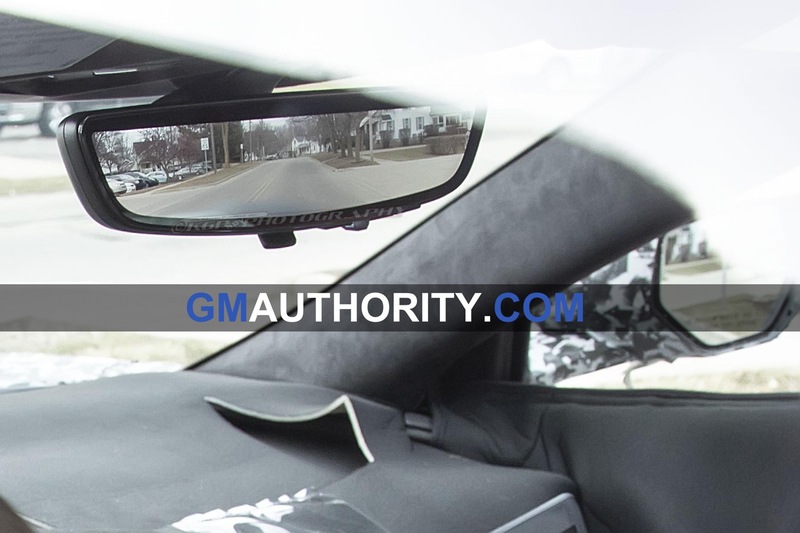 Cadillac still has to round out its portfolio to sedans and suvs then bring out the halo car to bring buyers into your showroom with name recognition and may lead to a uptick in sales across the board. 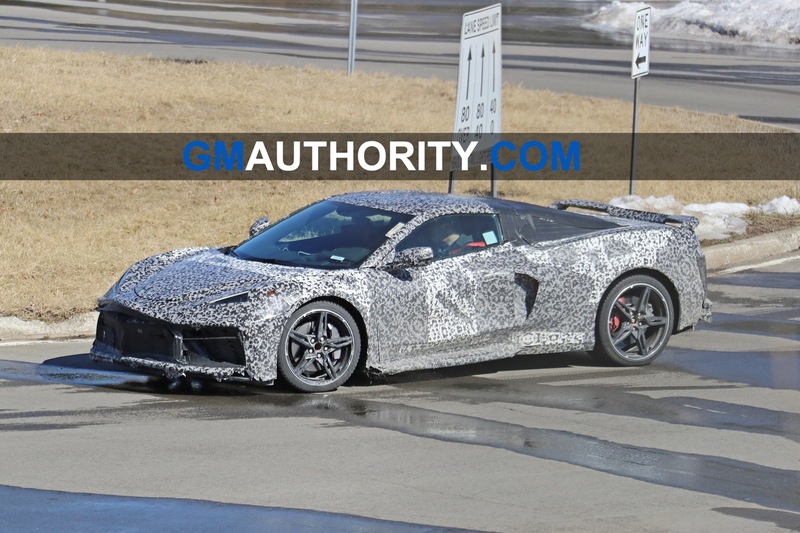 +1 you are spot on. 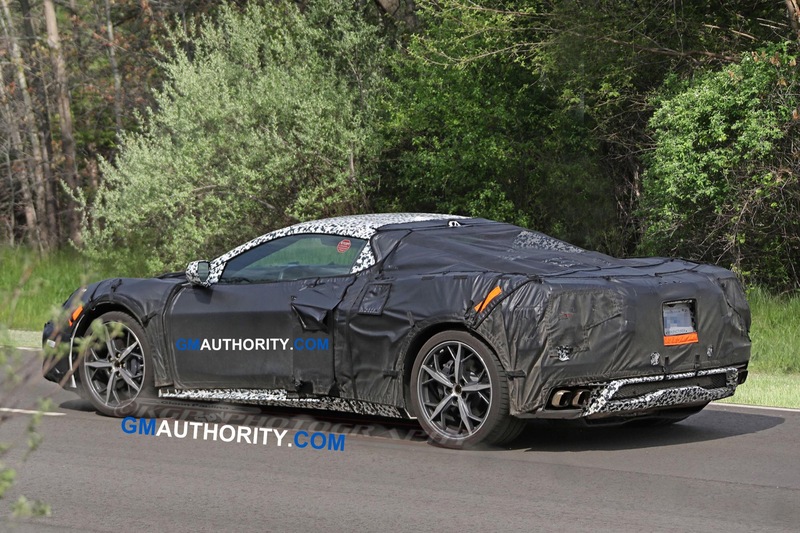 Cadillac needs to get their house in order on their core product and be competitive on the products they are seen for before taking a Super Car on. 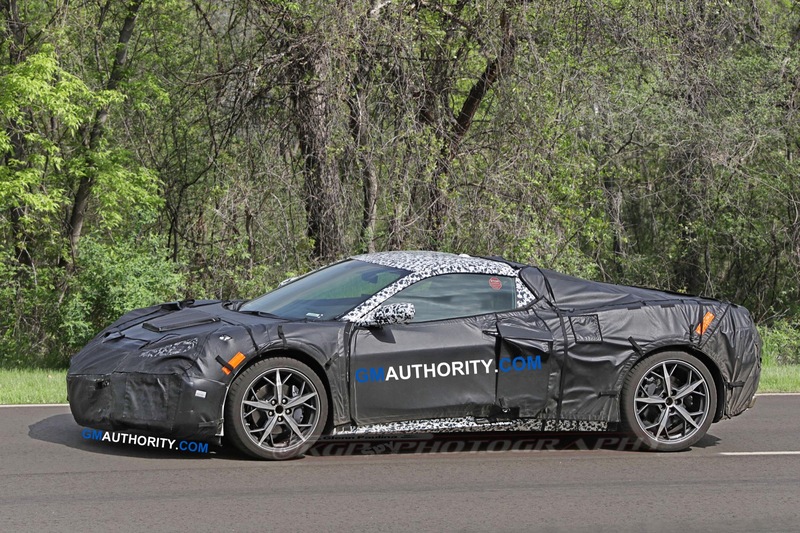 To sell a $180K Cadillac sports car they need to earn the right first to expect someone to pay that kind of money or it will fail like the last two 2 seat cars they have done. 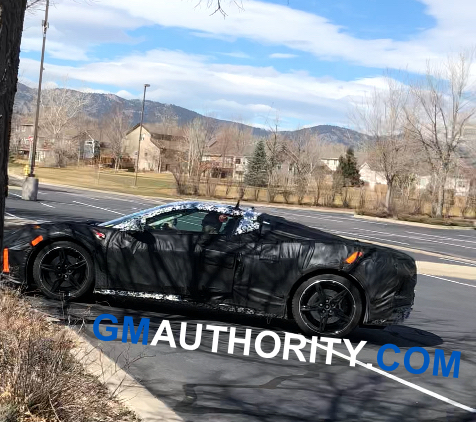 Halo cars shine down on the rest of the line but if you do not have the rest of the line ready and right you end up with a sports car that loses 2/3 value in a year or two and sell no more core product. 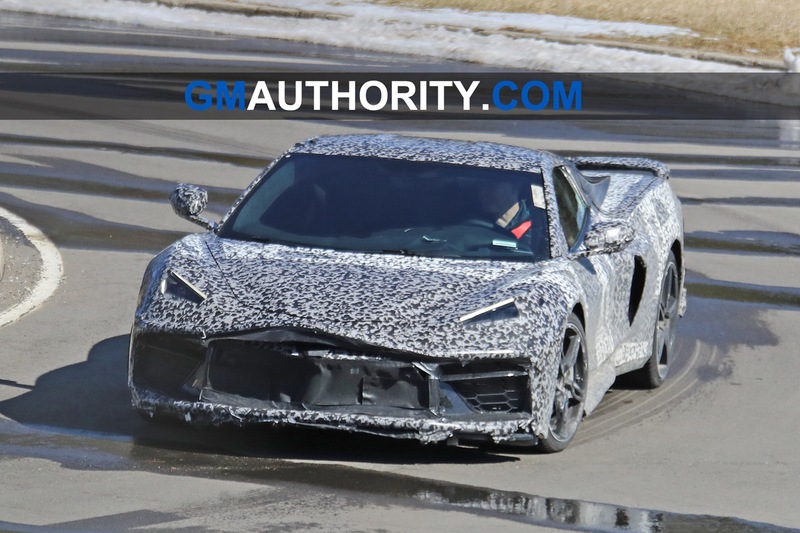 At some point they will look into this but right now they need to figure out how to sell a Luxury sedan and more SUV models. 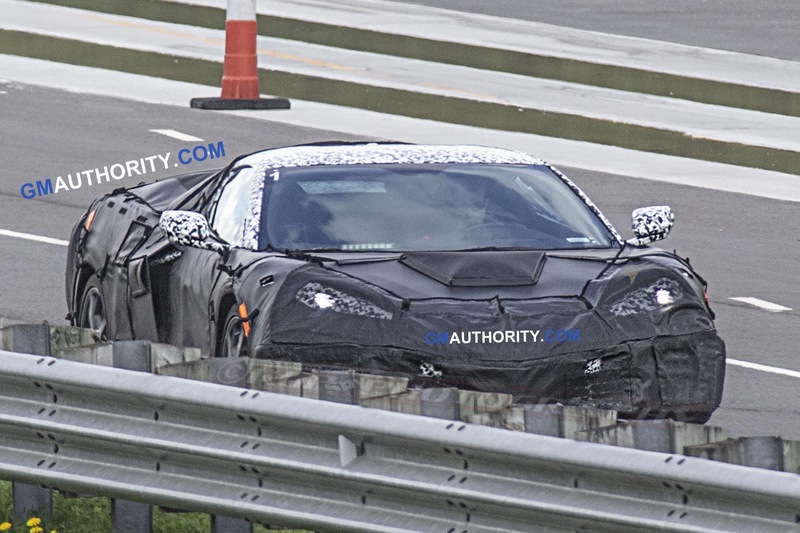 They did successfully rebrand in the DP (Daytona Prototype) racing class from Corvette to Cadillac though. 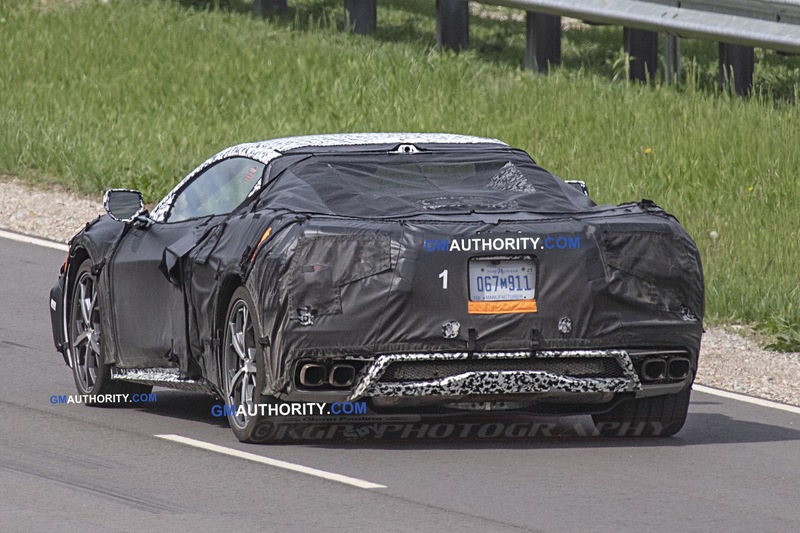 I wonder if part of the reason behind that was to gauge interest in a road-going Cadillac supercar. 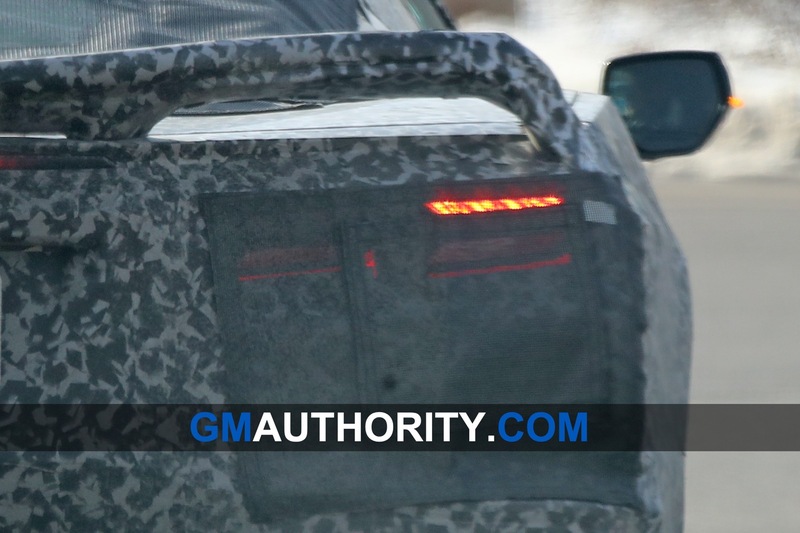 Hopefully they bring back those iconic round taillights..
Not happening. 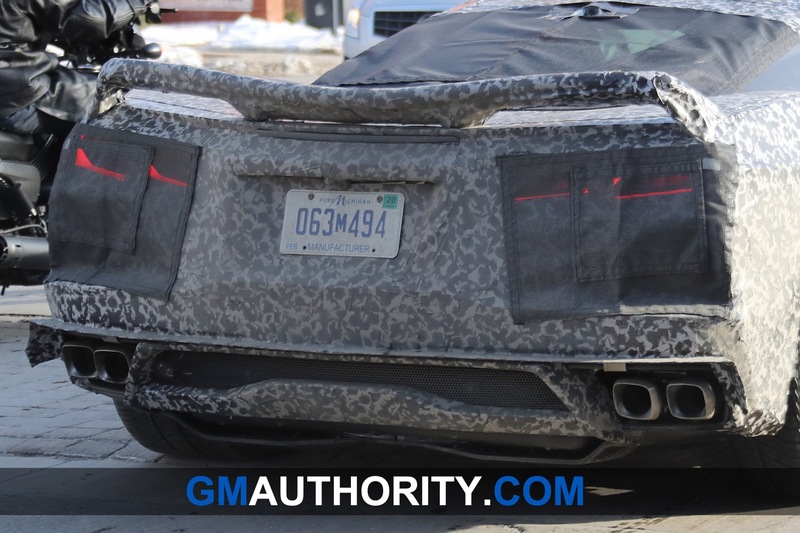 They’re going to resemble Lamborghini Adventador and Huracan taillights, and they’ll look amazing. 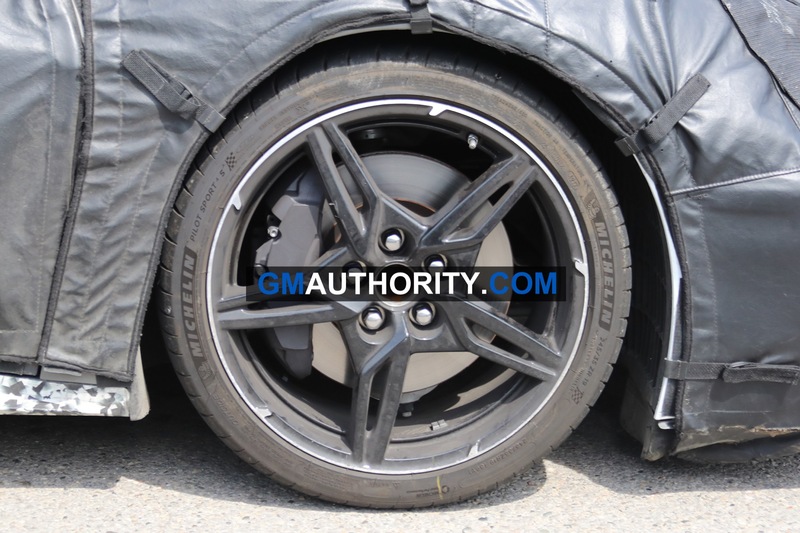 Yes and we’ll leave that to the Datsun GTR. 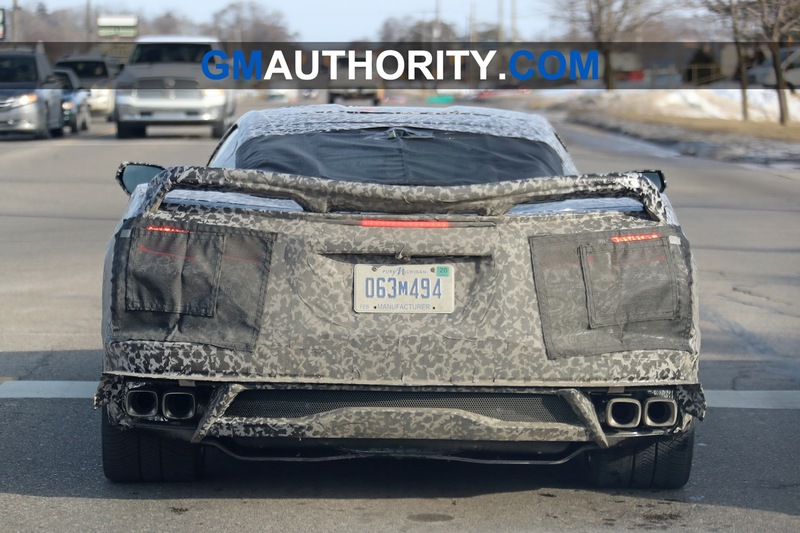 Under the covers in the photos the rear resembles the 1988 Pontiac Fiero GT that I owned for many years. The rear deck had vents on both sides and the “buttresses” had plexiglass windows windows for visibility. 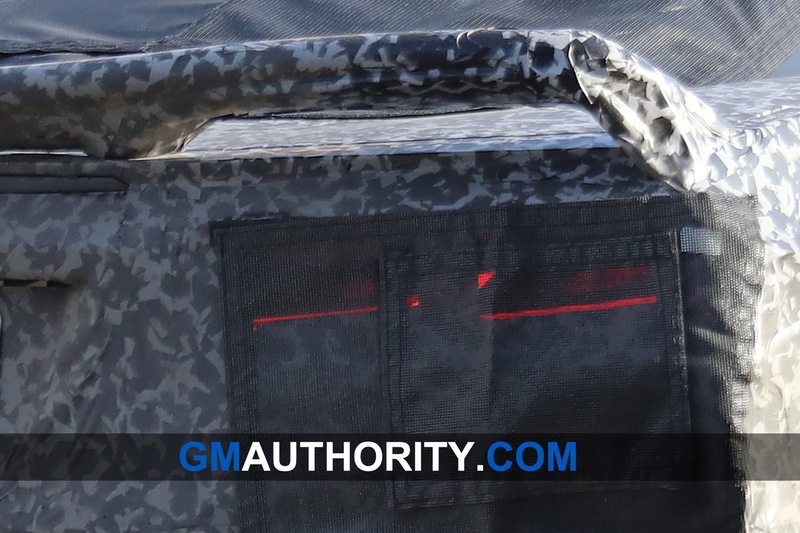 Simple design and it worked well. 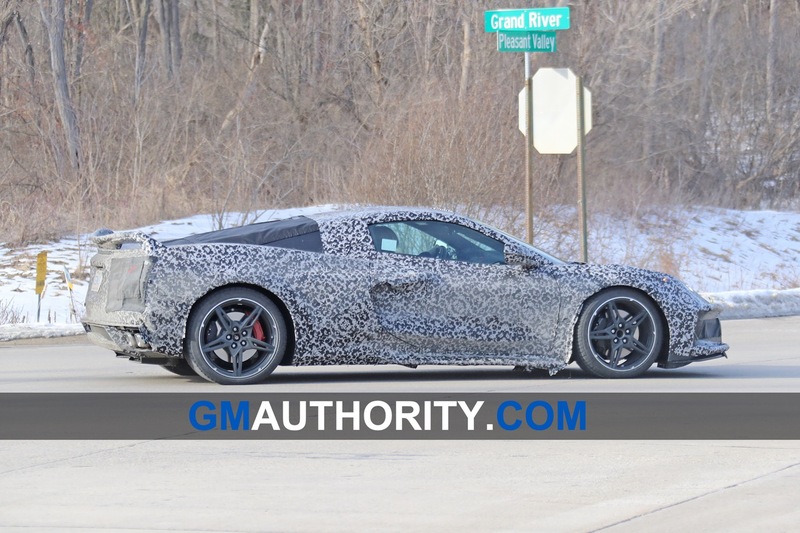 Flat engine area on a GM Mid Engine vehicle is not new. 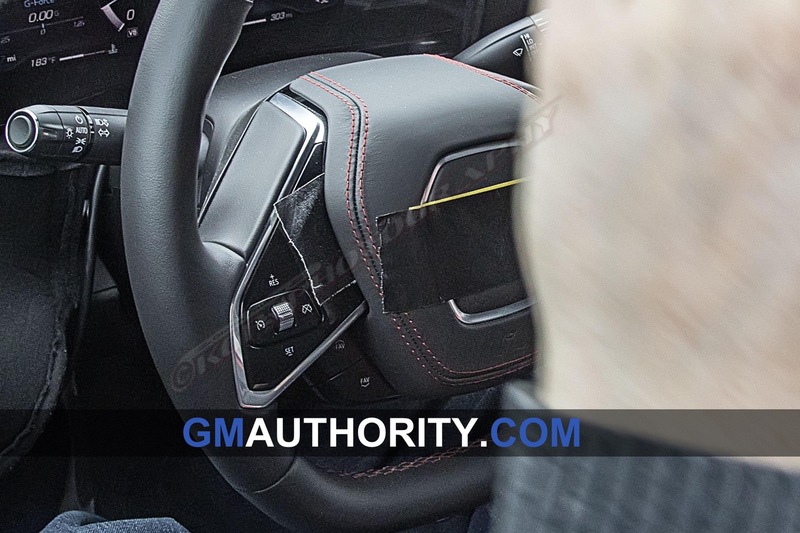 GM did this years ago. 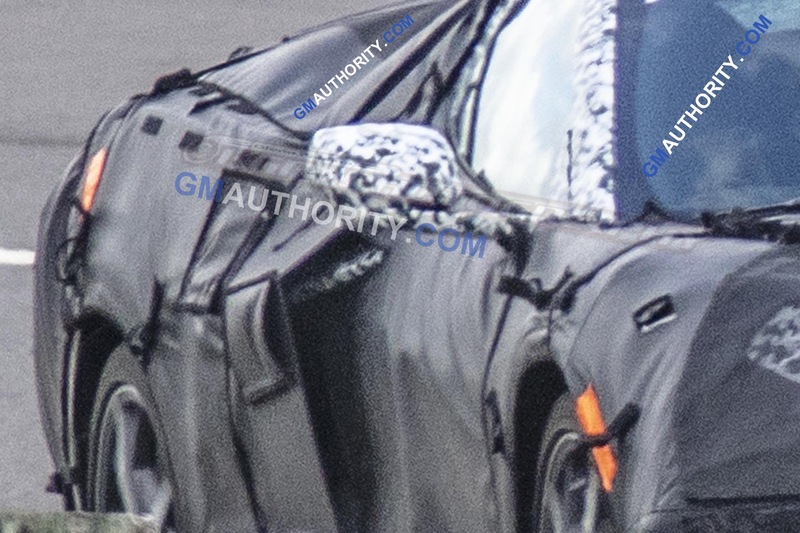 according to them, the engine will be covered by glass. 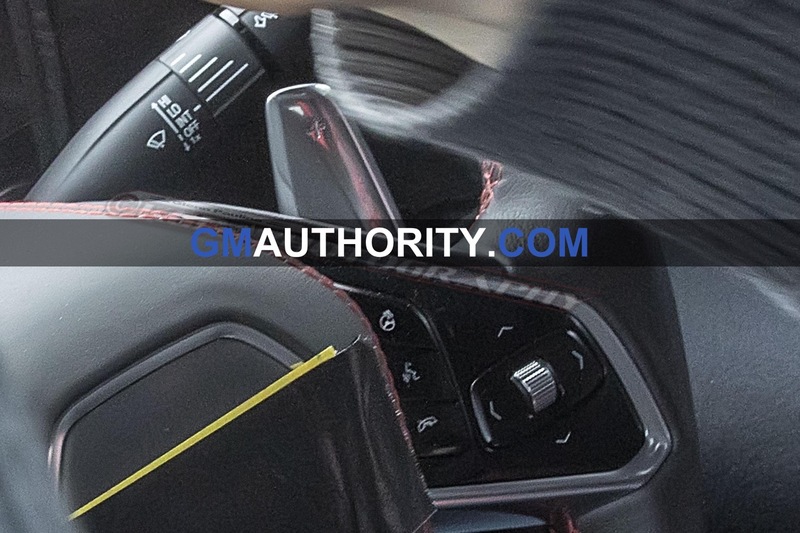 I am not feeling this design. 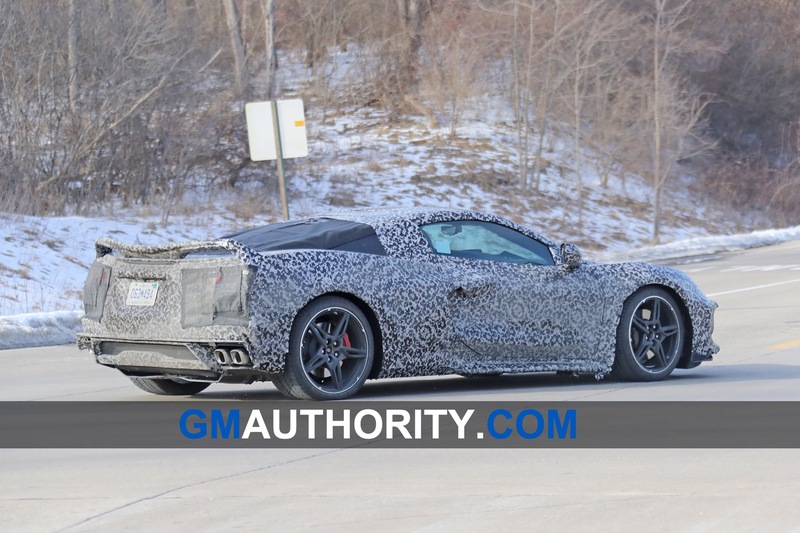 I have a 2016 Z07 vert and was hoping for a better design. 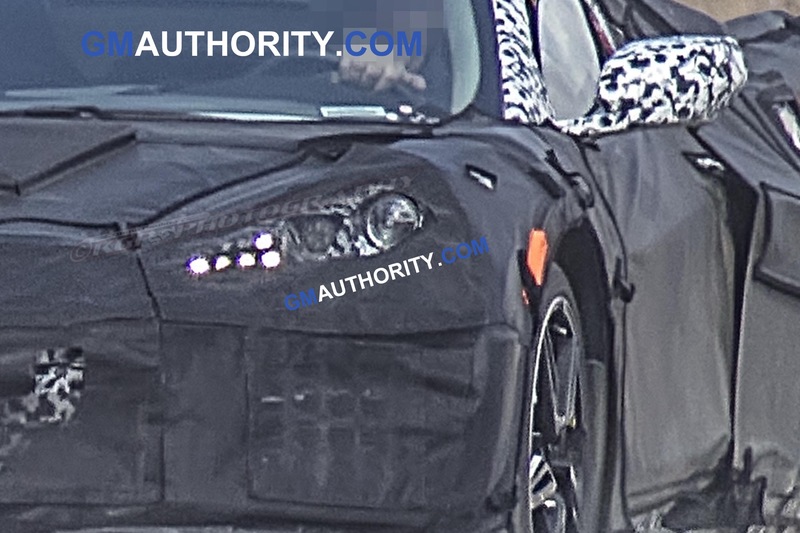 It looks ugly to me but that is JMO. 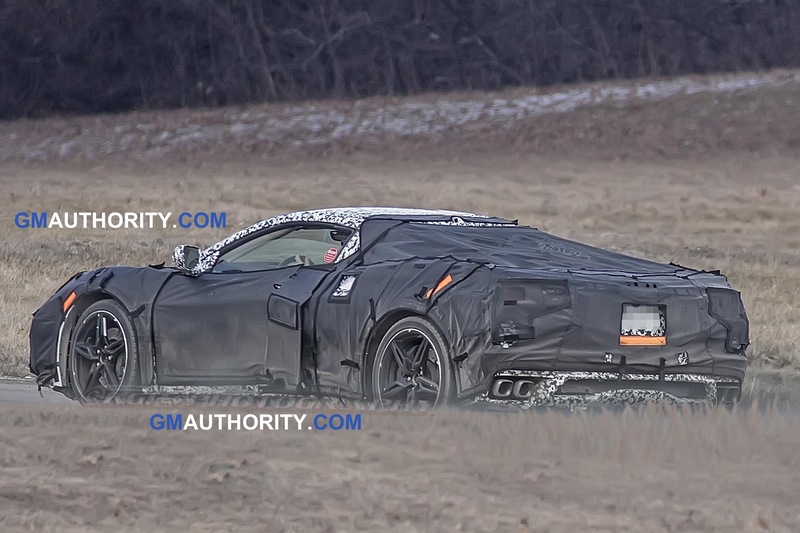 I will wait to see how it looks in all its glory and then determine C8 or go with the 911 GT3 RS.